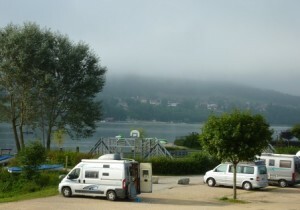 We crossed over the short border with Slovenia without interruption and drove towards a camp site that is part of a thermal spa complex, one of many in the area, where the official tourist agency literature said that there was a parking area for motorhomes. However, as we approached it was clear that the area in question was not only packed with cars, motorhomes were not permitted to stay the night there. We did not fancy going further in and sharing the expensive spa camp site with hundreds of others. Norma pointed out that if we simply kept going along the road we would soon be in Austria, which was on the draft itinerary anyway. So we pressed on a short distance and followed a sign into a very quiet site a flat field behind some farm buildings with basic facilities, not noted in any of the camp site literature we carried. This sort of place usually suits us well, so we settled in. Little shade, but some clouds coming over. Cleared by morning. The little town where we had ended up, Bad Radkersburg, lies in a little tongue of Austria, poking into north-east Slovenia and sharing the topography: flat lands with lots of thermal pools and spas. On the other side of the village from us lies another “Terme”, undoubtedly popular. We walked into the town in the morning. It lies on the Austrian bank of the River Mur, which finds its way through a long length of eastern Austria, and was once an important trading centre and port. On the other side of the river is Slovenia. The town was fortified in 1205, and the walls all round are still apparent. 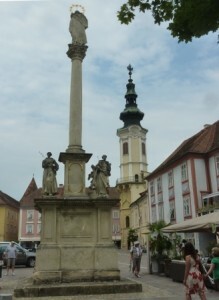 In the town square is an attractive Rathaus, or town hall, and in the centre is the typical plague column, this time for 1681. Shades of the town’s past importance are in the graceful buildings around the square and in the surrounding streets, in splendid condition, coloured in various pastel shades. Peaceful afternoon starting the research on Austria. We have visited the country twice before in the van: for the first time in 2008, when we crossed from south to north via the magnificent Grossglockner Pass en route between Slovenia and Bavaria, and again on a west-east run through the Swiss and Austrian Alps. 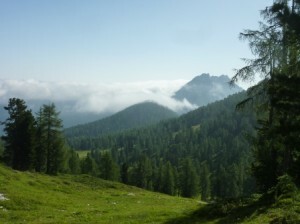 We generally try to avoid retracing our path, but there is still plenty of Austria that we have not seen. Austria is a nation at a crossroads on the main routes between northern Europe and Italy, and from west to east. Its prominence and political influence grew under the Habsburg dynasty over a period of 700 years, expanding through matrimonial alliances rather than conquest (mostly). The empire at various times included parts of the Czech kingdom, Hungary and Italy. As already described, in June 1914 the Serbian student Gavrilo Princip shot dead the heir to the Austrian throne, Franz Ferdinand, triggering the fall of dominos that resulted in WW1 and the collapse of the Habsburg dynasty. In 1938, with the approval of the Austrian people, Austria was integrated into the Third Reich (Anschluss), but after the war the Allies allowed the restoration of the Austrian state. Austria is now the 12th richest per capita country in the world (IMF 2012 figures) and the richest in continental Europe apart from the Scandinavians and Switzerland. The contrast experienced when driving into Austria from Hungary – which itself has undergone a remarkable recovery from the Communist days – is a striking testimony of the difference, in terms of roads and driving, houses and towns, and other visible infrastructure. Got very hot in this shadeless site in the afternoon, but still very peaceful, with only a couple of other travellers, so decided to stay another day. Clear, blue and hot (300 in the van) start to the day. Morning walk into town, once again enjoying the ambience. At the further end from us, and rather tucked away under the trees, we came across an interesting memorial, but one not in the tourist brochures. 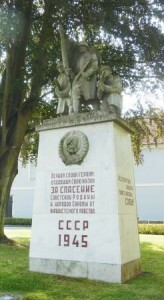 This is a Russian war memorial, with Cyrillic wording and a prominent CCCP lettering on a block supporting the statues of three liberating Russian soldiers. The Russian army was the first of the Allied forces to liberate Austria from the Nazis, as was the case for most of the eastern European countries. In 1943 a Moscow conference of the Allies decided that Austria should be restored as an independent state, but in 1945 it was divided into four zones of occupation. Fortunately for Austria, and unlike most of those countries which would end up behind the Iron Curtain, the Communist Party did not gain dominance after the war, and in 1955 the Allies withdrew and the country was proclaimed a permanent neutral state. Cooler as sun goes down! We walked along the River Mur to the other camp site, where we had originally been bound, and found a typically busy thermal spa site, surrounded by hotels and car parks, very busy with serried ranks of vans and caravans. Not our sort of place, we confirmed. Back in the afternoon we did experience the worst aspect of our pretty little location, which was the complete absence of shade. It got very hot in the afternoon, about 350 outside under the awning and over 370 inside the van. Had a chat with a pair of Dutch caravanners who have shared the place with us all the time, hearing their dismay and concern about the rate of immigration into their little country. Tolerance was not a feature of their position on the matter! Cool first thing but rapidly heating up. By this time we had agreed that we would stay in Austria and explore those parts of this generally very pretty country where we had not been before. But first to the local Hofer (Aldi) supermarket for some basic stores, before tracking west along the Mur for a short distance to see the watermill, in German a “ship-mill”, moored to the bank in Mureck. These were set to lie in fast-flowing streams; the water-wheel is set between two hulls, one of which encloses the mill apparatus in a superstructure. This one is simply a representation of what they once were, being a cafe within a complex of restaurants, spa pools and a camp site adjacent to the river. Then up northwards via the southern Styrian (Austria has provinces, and this is Styria) wine route, so called, but few vineyards to be seen; the most popular crop is, again, the ubiquitous maize/corn. What few vines can be seen are growing on impressively steep hillsides that look very hard work to tend. Stopped for lunch in the town of Stainz, parked by what was a hilltop Augustinian abbey that was converted into a palace but still encloses a church with an ornate interior. A wedding was soon to be in progress there, with people assembling. Then north again, into the Gleinalpe mountain range, and up a well-surfaced, steep but easy motorcycle-friendly Gaberl Pass at about 1,500 metres. This is ski country, and we chose to stay and spend the night in the large car park near the ski runs and associated cafes, hotels and the like. Mountain-top thunder and lightning in at about 4:00 pm after a warm afternoon, and some rain, but mostly cleared by 6:30. Enjoyed watching the friendly cows across the fence by us, treated like pets by their owners. As the motorcycles gathered at the gasthaus as a breakfast break during their Sunday run, we set off north-west down the other side of the pass to Judenburg, a mercantile centre named after the Jews who once lived there. Then up into the Styrian alps again and over the Rottenmanner Tauern via Hohentauern. This was a miraculously beautiful drive, the most lovely of the trip so far, running through shining green Austrian scenery, brightly flower-bedecked houses and villages, and all surrounded by mountain peaks of over 2,000 metres. The highly impressive descent into Trieben is a masterpiece of modern mountain road engineering, once again attracting scores of motorcyclists on its excellent surface. North again over a smaller and steeper little pass on a minor road to Admont, again a gorgeous run. In Admont there is a large Benedictine monastery, the site dating back to the 11th century, but the present building was built in 1865 after a destructive fire. As a result of what was supposed to be a miracle, the outstanding feature of the monastery, its library and books, was spared from the worst, and remains the reason for the visit. We like old monastery libraries. They are usually beautifully designed and decorated, and the amount of handwork that went into the thousands of books lining the shelves is inspirational. This one is claimed to be the biggest monastery library in the world, but others we have visited would be at worst a close match. 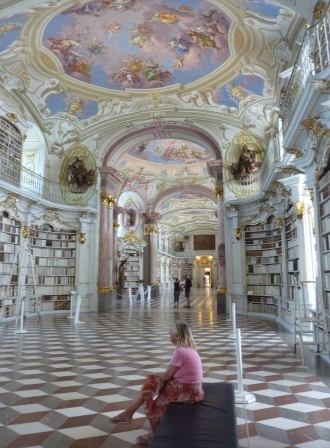 Its decoration is predominantly white, with pastel frescoes on the ceiling in its several domes, and as very many of the books are bound in white leather, the whole has a very light and airy ambience. 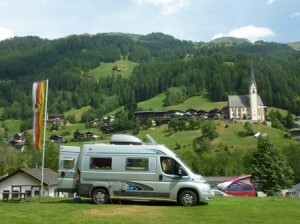 A bit of a problem with touring in Austria, as we have found before, is the camping situation. Most camp sites in the guides are of the nature we tend to avoid, large and concentrated in touristy areas such as rivers, lakes and thermal spas, and with swimming pools, children’s’ games areas, shops and the like. Small municipal or private sites are rare and hard to find. Motorhome overnight parking areas, such as are common in most of the rest of old Europe, are again uncommon and – as we found in the case of one we were aiming for in Liezen, near Admont – tend to be very small (room for two vans only in this case), in unpleasant places and free of any shade. By this time it was exceptionally hot, well into the mid-thirties. So we pressed on with part of what was going to be the next day’s run, an easy run on a busy road down the valley of the River Enns. Approaching the mountains of the Schladminger Tauern we cut north from Grobning up a very steep, winding and narrow little road, marked on our map as scenic but “not recommended for caravans”. In fact, I don’t see how caravans or large motorhomes could make it at all; it’s not common that I have to use the Ducato’s first gear to get round some of the hairpins, and the width of the road here barely allows two cars to pass. But nearing the very top, to my relief we came across exactly what we were looking for but only hoping we would get, a large gravel car park at 1,712 metres, intended for summer walkers and winter skiers. We parked with a lovely view over the valley to high mountains the other side, and were pleasantly warm instead of uncomfortably hot. There is a typical alpine restaurant by the park, and to our amazement we got free wi-fi provided as a service to skiers by a consortium of alpine resorts. Using a free app we could plug in our level of expertise and fitness, and choose from the runs in the area. 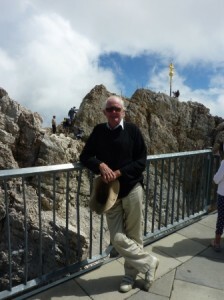 Being summer, it was walking rather than skiing that was the attraction, and as our first alpine walk of the season we made it up to the summit of the mountain on the side of which we are parked, to a height of over 2,000 metres. Some clouds early, and mists in the valleys through which a wind was blowing, made conditions good for a morning’s outing. Later, as confirmed by a look at the forecast on the internet, clouds rolled in, with more cool winds and rain later. It seems that the heat wave here is over, and is now affecting the Balkans now. Squally weather overnight, cloudy and cold early. Clouds all morning, with some drizzle, but lots of walkers up. Stayed put, and battled with the web site to try to get the latest part of the story up. Main problem was the slow and unreliable connection. Remained cool all day, drying up later. Finally managed to get the diary out. Skies clearing, but still cool – heater on for first time in many weeks! Hoping for clouds to clear, but no such luck in the morning – 100% cover with low white overcast. But needed to move on for basic services, so away down the steep little road, seeming easier than coming up a couple of days ago in the evening after a long day’s drive. Easy short drive to Schladming, a fair-sized town, first for shopping at a large Spar supermarket, well stocked by the standard of the last few weeks. Norma thought it was “a bit overwhelming”. Our intention with regard to visiting this town and the immediate area was to take a ride on a cable-car up the biggest mountain here, the 3,000-metre Hohen Dachstein. But then the problem with camp sites in Austria arose. We first went to what was in a reference book as a motorhome parking area with facilities, but this is now simply a car park for a chairlift (not operating anyway). So we then went to the first of two possible camp sites, and it looked dreadful: sited between a main road and a railway, it was packed with permanent caravans and looked most uninviting. So went up into the hills a bit to around 1,200 metres for the other possibility, and settled in there – a much better site but not our sort of place really, very crowded, principally with permanent caravans, most unoccupied, but with lots of holiday-makers in any event. Some horror at reception that we had not booked, but got in for the night. Very little space for travellers on the move. Turned out that this is a real holiday precinct. There is a big open pool dug into the ground, looking like a natural lake, a chairlift up into the lower hills, two restaurants, and a dummy bobsleigh run with little cars on a track. Hundreds of cars parked here, mostly for walkers and others using these facilities. Skies clearing during the day, and quite hot in the sun, so hopes for a sunny day tomorrow. Filled water tank and cleaned up in a rather grotty and inconvenient motorhome service point, and away in what we thought was good time to get to the cable car station not far up the road. 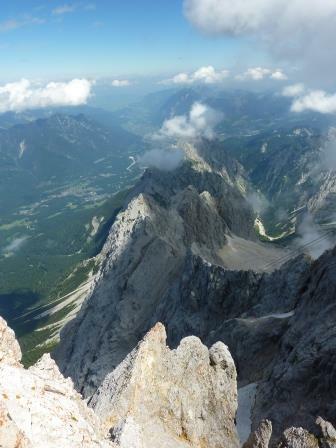 This takes people up the steep south side of the Dachstein Massif, which we had been looking at from the site. The highest peak is about 3,000 metres. However, when we got to the start of the road up to the cable car, we and other arrivals were told by a flustered and rather cross lady that the car park was full and to go away. Then some cars did start going up, and it was clear that another car park had been opened; however, we were told that there was a two-hour wait to take the ride. There are lots of other cable car rides in the area, so we decided to move on. What we did was to drive right around the western end of the massif to Gosau, via the Ennstal river valley and some typically lovely Austrian alpine scenery, and took a cable-car ride up the north side instead. This turned out to be a much better option anyway. By the time we got there it was mid-day, and although there were hundreds of cars parked, the people had already gone up, mostly for long walks. South of the little town of Gosau is the area of the Gosauseen, two small alpine lakes sunk into deep limestone gorges and shining blue. The cable car departs from close to the larger lake, which helps to enhance the staggering view as it ascends. 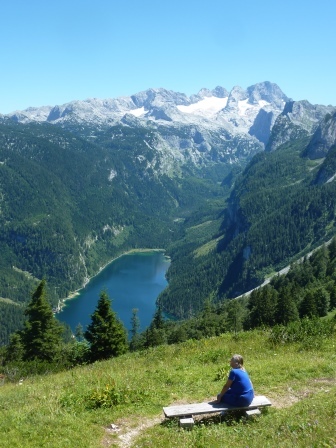 Overlooking the lake is the north side of the Dachstein range, the easternmost of the Alps. 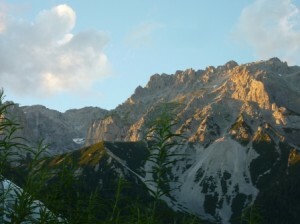 The highest peak, Gosaukamm, is about 2,200 metres, and its high glacier is always covered in snow. The contrast between the peak and the blue lake is beautiful, and can be seen in photos in all the tourist literature (see our photo left). We had not known what to expect at the top. It did turn out clear blue and hot in the sun, but we thought it would probably be cooler up high. Wrong! It was still pretty hot walking in the sun. We also had no idea how hard and how long we would be walking – turned out to be quite a hike, up to one of the smaller local summits, and we regretted not bringing up our Nordic walking poles, which do make things much easier in the hills. Over the top we could see gentler slopes extending for miles, mostly being cleared as ski runs for the winter. Other users of the peaks were para-gliders, some of whom were riding thermals and spiralling higher and higher along with the birds. There were some pretty tough walks available, including a traverse of what looked like a vertical face using fixed ladders and lines, but we really are too old for some things! We were up in the heights for most of the afternoon, but by 4:00 we needed to establish a place for the night. We drove east down a minor pass to Halstatter See, one of a complex of lakes east of Salzburg in the region known as the Salzkammergut. This is a gorgeous area, but not surprisingly it is exceedingly popular with the local people, especially at this time of the year, the start of the holiday season – and in something of a heatwave to boot. (When we were here last, on exactly the same dates in 2008, it was mostly cloudy and raining.) So we were in serious competition for places to stop, park and camp. But I soft-soaped the lady in charge of the only camp site in the little town of Halstatt and were given the last available pitch, which was in a very hot little corner. So we set off walking again, to have a look around the town. Set on the side of the lake it would be picturesque anyway, but the shore-side land is incredibly steep. Wooden houses range one above the other almost vertically behind the town, layer upon layer. Space is so limited that the parish church, down by the lake, lies sort of sideways on, so that the east and west ends of the church can point in the appropriate direction. The little “main” (mostly) pedestrian street runs along close to the water’s edge, and is lined with shops selling all sorts of goods attractive to tourists who buy things, but of a much higher standard than we usually see in such places. When tourists started coming in great numbers a few years ago, a proposal was put to them that the street should be widened to cope with traffic, and only “a few” houses would need to be demolished. The residents kicked that idea into touch, and the solution was to build tunnels through the cliffs above the town to bypass the traffic. The spoil from the excavations was put to building an artificial island, linked by a bridge to the land, and was very popular this day with sunbathers and swimmers. Before leaving, I tried to join a teleconference in Australia, but the mountains surrounding us were so high and steep that the mobile kept dropping out with such frequency that I gave up. The plan for today was to do a tour of the lakes, so we set off north over a minor pass, through Bad Ischl and on to the Attersee lake, the largest in the Salzkammergut. The lakes are all long and rather skinny, because they are of glacial origin, but the larger ones are still easily big enough to support lots of yachts, and electrically-driven ferries and motorboats. We drove pretty much all round it, once again enjoying the spectacular scenery (trite, what more can you say about places like this?). Across then to one of the smaller lakes, Mondsee, and down to another really pretty one, Wolfgangsee. On its eastern shore sits another little town, with the big name of Sankt Wolfgang in Salzkammergut. We had been meaning to camp there but the roads and environs were seething with holidaymakers. The one or two sites we could see were packed, and we were sure they all would be. So we tracked back to the western shore and stopped in one of the many parking places on the lakeside – and one which, rarely, had a parking spot to spare! There are many such parking places all around most of the lakes – some quite narrow and small, like this one, and some extending into large fields which people were using as immense picnic areas, with umbrellas and tables, and walking down for regular swims to cool off. Fearing that the water would be (literally) icy, we entered the Wolfgangsee with some trepidation, but the temperature was really pleasant and a welcome relief from the heat of the day. By the time we were leaving we discovered that we should have been paying, but nobody else seemed to be doing so and nobody was enforcing it. But there was a clear notice that staying there between the hours of midnight and 4:00 am was verboten, so there was no chance of staying the night. The road was very busy, too. Traversing a small pass down to Wolfgangsee we had noticed a few large pull-ins, where the new road had straightened up some winding bits. These often make good places for an overnight stop, and we chose a good one, with reasonable shade, to do just that. Quiet and peaceful night on our own, then west for an easy 45-minute run to Salzburg, with flocks of holidaymakers pouring towards the lakes from the other direction. We made a two-day visit to the city a few years ago, seeing all the sights and more, but this time we simply wanted another look at this most attractive city, a smaller and simpler version of Vienna. We entered a large car park very close to the centre, named after the Schloss Mirabell which is right alongside. Parking for 24 hours is allowed, but “camping” is not. We discovered on our previous visit, as appears to be the case still, that simply sleeping aboard, without putting all the appurtenances such as chairs and awnings out, is not regarded as “camping”. We chose a shady spot, a silly mistake, because by the time we returned to the van the sun had swung round and the temperature in the van was well over 40o C.
Meanwhile, we walked into the city and became re-acquainted with all the little streets, churches, markets, horse troughs and horse carriages. Plus all the Mozartiana stuff too, which was perhaps not quite as overplayed this time. 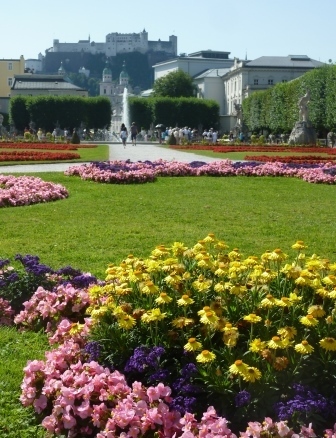 One thing we didn’t see last time was the beautiful garden of the Schloss Mirabell, with lovely curvaceous flowerbeds shining bright in the sun. The city was quite busy with overseas tourists, many of them from Asian countries, as we had seen down in the lake towns too. We took the funicular railway up to the 11th century Hohensalzburg Fortress, which is perched up on a rocky peak overlooking the town. It was modified and increasingly fortified up through to the 16th century. Now it’s a museum with warlike features, mostly pretty well done. We had an acceptable lunch up there, in what is probably the most touristy restaurant in Salzburg! But the beer was cool and refreshing, and there was a breeze that was notably lacking down in the city. The Salzburg Festival of music was just getting into full swing, and there were lots of street players. 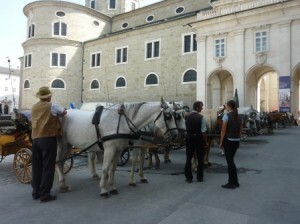 The best concerts were yet to come, and unfortunately it seems that Saturday is not a concert day in Salzburg. Yesterday (Mozart Requiem in the cathedral) or tomorrow we would have more of a choice! We settled for a simple but pleasant little concert in the Residenz, an imposing building adjacent to the cathedral; a selection of harpsichord pieces (including Mozart, of course) and a powerful soprano singing arias from – er, Mozart operas. Back to the hot van late afternoon, and moved into a shadier spot – but then joined by a big Italian van right next to us, blocking what wind there was (hardly any), obviously worried about being too obviously “camping”. We could have reassured him (I think). We hadn’t decided where to go the following day, but we did agree that over the last few days we had enjoyed some of the most beautiful countryside in Europe. Big wind in overnight, followed by thunder and lightning and some rain, a turbulent start to my 76th birthday. So a bit cooler in the morning. Moved out after paying the €18 24-hour parking fee, then an easy run south over the transparent border with Germany to Oberau. This is in the region of Bavaria called Berchtesgadenerland, a lovely group of mountains in a bit of Germany poking like a tongue into northern Austria. It is of course notorious for being the location of the Berghof, one of Hitler’s headquarters in WW2, and the Kehlsteinhaus, the “Eagle’s Nest”, Hitler’s retreat on the tip of a peak with a staggering view. We explored all these fascinating sights in 2008, and took a boat ride on the lovely Konigsee, the highest lake in Germany. We only went about 25 km from Salzburg to a stellplatz in Oberau, a stellplatz being the same as the French aire: a dedicated motorhome-only parking place, some (as in this case) with power and other facilities. Being early we were able to pick a good spot and settled in for a bit of a rest after a busy few days. Another quiet day, with just a walk down the steep hill into the village of Oberau and the little supermarket for some basic supplies. Otherwise just reading most of the day, while later hordes more motorhomes piled in, well over 20 by nightfall. A nice surprise was the arrival of a British van, a most pleasant Blackburn couple with their very bright 8-year-old daughter, looking forward to visiting the Eagle’s Nest because of her interest in history. 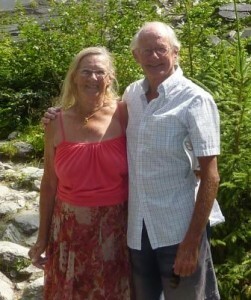 They are the first Brits we have come across for weeks, apart from Paul in Serbia. It was good to have a conversation with other native English speakers! A bit of a backtrack through Berchtesgaden to start with after leaving this busy but very pleasant stellplatz, then bypassed the pretty town of Ramsau along an attractive road heavy with holiday traffic. Then cut south for the fantastic drive down the Grossglockner Hochalpenstrasse, one of the best drives in Europe. We drove it south to north in 2005 but this time north to south, the toll having increased to €33 this time. It’s an exceptionally scenic run, with high mountains on all sides, and some impressive hairpinned rises and falls. But the toll allows for a high level of maintenance and construction on the road, so that the heavy traffic does not cause any great congestion. And there are lots of places to pull off and admire – and inevitably photograph – the marvellous views. We encountered one unusual occurrence on the way up, though. 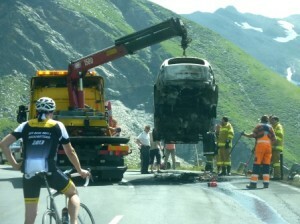 For reasons that we’ll never know, a small car had caught fire on the way up the pass, and we came upon the burnt out wreck in the middle of the right-hand lane. It must have been quite recent, because the fire crews were still cleaning up the scene. The tow truck just beaten us to the wreck, so that we had to wait and watch while it was lifted on to the truck and taken away. At the top we parked in the place for motorhomes. We asked the wee man whether it was possible to stay the night there, and he replied “the law says no”. Overnighting in national parks (which this is) is verboten. So that seemed to settle the matter, although we did wonder whether his words were carefully chosen . . . 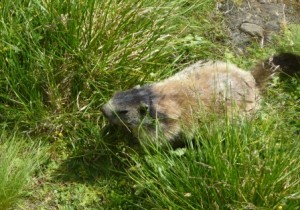 Walked up to the top of the road, and had a look at a few marmots going about their business in the grasses below the road. There are lots of walks from that point, but at nearly 2,400 metres high you have to be pretty fit. We were content to enjoy the view over the Pasterzengletscher (glacier), and up to the top of the Grossglockner mountain at 3,798 metres, the tallest in Austria. The sun was shining, there was some scattered white cloud, and the temperature was a comfortable 220 C, excellent conditions for the hundreds of people up there. 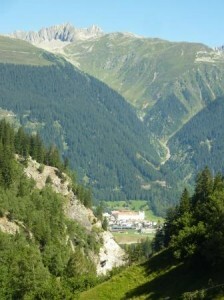 Just outside the southern edge of the pass, after a tortuous descent, lies the village of Heiligenblut. The camp site is an open one in a valley at about 1,200 metres and is set just below the village, so that we look up from the van to a famous church that appears in many publicity photos of the region. It was built by monks from Admont (which we visited a little while ago), and a tabernacle is said to hold a phial of the blood of Christ (hence the name).This is possibly not true. We will visit tomorrow. 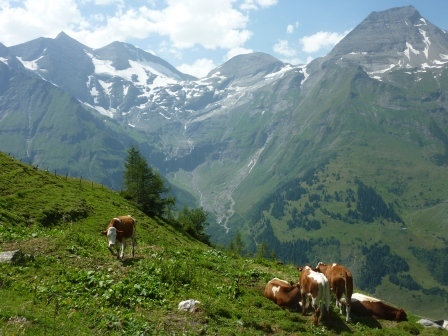 On the other side we look up to the pine-forested steep slopes of the Grossglockner National Park. This is one of the most scenically-attractive camp sites we have ever stayed at, and a nice change for us where Austria is concerned. Weather looking iffy in the morning, with clouds over the mountain-tops and a west wind steadily increasing. Walked up the quite steep path from the site to the village, and visited the church first. Quite a plain structure inside and out, as befits its monastic origins, but boasting a beautiful Pacher altarpiece that dominates the rather spartan interior, its huge doors wide open to welcome visitors. Some beautiful driving again today. First, continuing south along what is still effectively the Grossglockner road, and down to Lienz. 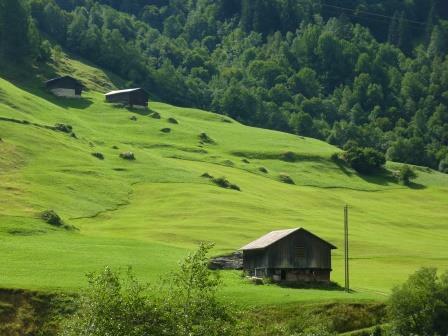 More lovely Austrian scenery, along the Moll valley, bright green alpine meadows sweeping down to the road, dotted with classic wooden Austrian houses with bright flowers along varnished balconies. Then Lienz, to where all roads go in this region. Frantically busy, but we needed to have another internet session, and there was a McDonalds that provided the opportunity for the cost of a cup of better coffee than at the Heiligenblut guesthouse. Then, with the Dolomites in clear view ahead of us we turned and headed towards the north again, this time up the valley of the River Isel, fast-flowing and popular with rafters – and that did look fun, even if the water was rough and icy. This is a steep-sided valley with more of the rocky hillsides than the gently sloping meadows. Earlier, this spring in Austria, there was ferocious rain, which blocked the path of many travellers including our Australian friends Rex and Barbara in their van. We saw plenty of evidence of the effects on this stretch, with great swathes of hillside having collapsed. We were diverted from the excellent main road down on to a resurfaced very minor road because an enormous landslide had totally engulfed and washed away the major road and the pillars on which it stood. 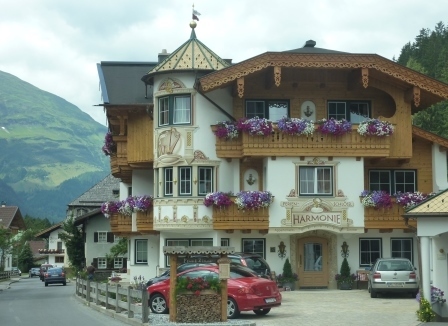 We turned off at Mittersill along the Felberntauernstrasse and headed west along another steep-sided river valley, this time the Salzac, and came to the little town of Krimml, in the middle of the wild scenery of the Hohe Tauern National Park. 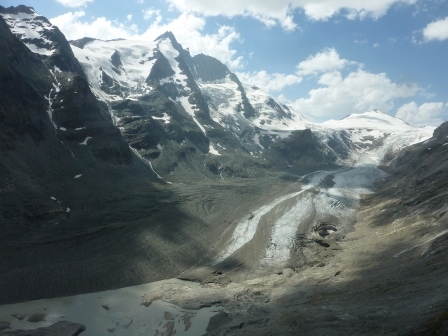 We came to rest in a good stellplatz associated with a hotel, and were able to take the kilometre or so walk to the famous Krimmler Wasserfalle, the waterfalls of the Krimmler Ache, the glacier of the same name at about 3,000 metres. 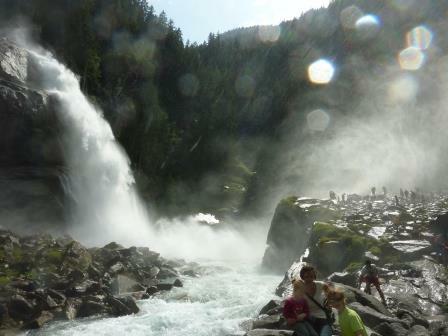 The falls are lovely, with a stupendous amount of water falling hundreds of metres. Their total fall height of 380 metres makes them the fifth highest waterfalls on earth. The average annual fall is of 177 billion litres, highest in the summer at an average of 57,000 litres per second. In the winter there’s little melt water, and the falls partly freeze over. Norma expressed some amazement that there’s any glacier left up there! We walked, along with hundreds of other visitors and sightseers, to the final pool in the fall, where the spray erupts and shines in the light of the sun, a gorgeous effect. An interesting memorial plaque on the walk to the bottom of the falls tells that at this point in 1947 a large group of Jewish refugees from Eastern Europe faced a 15-hour trek over the Krimmler Pass into Italy. They had come from transit camps near Salzburg and their ultimate aim was Palestine, to where all legal routes out of Austria had at that time been blocked by the British authorities. On the 60th anniversary of this crossing it was designated the Alpine Peace Crossing, dedicated to refugees worldwide. Cloudy but warm most of the day, cooling with sundown, then thunderstorms and heavy rain. Continued raining off and on overnight, and most of the day. So stayed put, both of us reading good books, plus some limited internet in the hour that cost €2 in the hotel which owns the stellplatz. Clouds well down over the mountains, so our walk yesterday was well timed. Some high white clouds, and much cooler, but mainly fine. Lovely run west over the tolled Gerlos Pass in the western end of the Hohe Tauern national park, starting with a great distant view of the Krimmler waterfalls. 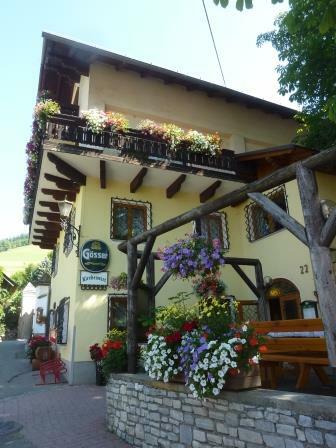 Then down into heavy-duty skiing country: chalets and guesthouses scattered all over the green valley and up into the foothills, classic Austrian-looking, high-pitched roofs, white painted with unpainted or varnished wooden balconies – and each and every one a mass of flowers along the balconies and porches, and in their gardens too. More beautiful valley driving towards Innsbruck and some shopping at a poor Hofer (Aldi) supermarket. We’ll avoid this chain from now on. Lunch in a simple urban stellplatz in the industrial town of Schwaz, then a visit to the Swarovski Kristallwelten. This is an extraordinary collection of walk-through displays put together by several artists using Swarovski crystal cut glass, set in park-like grounds the other side of the road from the Swarovski factory. We were rather disappointed not to be able to see how the products are made, but the cutting of the glass and the coatings that are used to create their shimmering and rainbow-like effects are trade secrets. 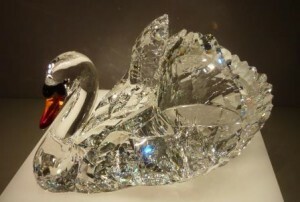 There is a big shop, not surprisingly, and the hundreds of visitors from all the world there were busily studying the wares in a way that proves the superb marketing of the Swarovski brand! 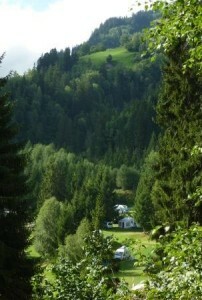 On to Hall in Tirol and a stellplatz forming part of a camp site we had previously stayed in on the 2009 tour. But we were directed to a dreadful position in a packed site by the grumpy proprietor, so left, and backtracked a short distance to Schloss Camping Aschach in Volders, with a friendly welcome to a lovely open site with trees, plenty of room and splendid views to the mountains behind us and on the other side of the fast-flowing River Inn. Free unlimited wi-fi, too. Still cool in the shade by evening, too cold for us to use the neat swimming pool that is another feature of the site. Took a walk up behind us to the schloss, a private dwelling apparently, although not actively lived in right now. Took part of what was a major walk through the forest then back down to the camp. All very pleasant, as was a quiet afternoon reading and catching up with Oz and other news on the internet. 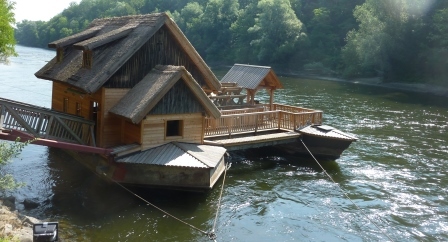 Away from this excellent site, one of the two best on this trip, along with Jovan’s place in Serbia – space, no permanents, hotel-standard sanitary facilities, wi-fi, friendly welcome – all quite simple, said the owner as I thanked him. Why can’t they all be like this? Pleasant enough driver further along the Inn valley, then turning north to cross the Fernpass, an easy pass but very busy with truck and car traffic. Down to Ehrwald and along a minor road to the cable-car station for the ascent of the Zugspitze. There was supposed to be a stellplatz there, but as we have complained so often of the Austrian situation it has simply been merged with a big camp site associated with the hotel. We were quoted €41 for the night, but we could stay for the day in the car park free while we made the trip up the mountain. The Zugspitze mountain is shared between Austria and Germany, and is the highest mountain in Germany at 2,962 metres (nearly 10,000 feet, when you start needing oxygen). The ride up from the Austrian side is one stage only, an impressive rise of over 1,700 metres as the splendid scenery opened up beneath and around us. 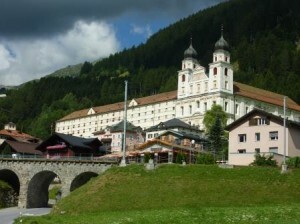 At the top is an extensive all-round terrace complex, German on one side where the cable-car from that country ascends, and Austrian the other – complete, of course, with the requisite restaurants, snack cars and souvenir shops. But all very well done, and whatever is there it could not possible detract from the astounding all-round views of all the neighbouring (lower) mountain ranges. I suppose it was a bit like being on Everest, albeit a touch higher. On a plaque naming all the mountains we could see, we were kindly advised that Sydney was 16,405 km away to the south-east. We were conscious about some doubts on the weather forecast from the day before, and while we were up there at about 1:00 pm, white clouds were embracing many summits and buildings. By the time we were coming down, much of the view would have been blocked by cloud. It is possible to walk up (and/or down) to the summit, but alpine experience is advised and people we saw at the top who had done it looked well equipped. From the top and from the cable-car we could see a few walkers and their task looked pretty daunting, with narrow ridges and narrow paths across traverses. From the summit terrace it was possible to take a final scramble of a few metres to the tip-top rock, but even this required fixed lines and steps. Some ill-equipped tourists just looked silly trying it, despite the warning signs, and the potential fall looked scary to us. Having decided to move on to a less expensive place for the night we chose what from the book looked like a good site at the end of the Plansee lake. But on inspection the place was packed out by permanent tents and mobile homes, so we back-tracked down the lake for a bit to another site, also very busy but mostly with touring caravans and motorhomes. It was pretty much full (an Austrian lake problem!) but the wee man suggested a place down near the lakeside road, which was acceptable and with a view of the lake. Walk down to the lake and immediate environs. Rain in overnight, and continuing in the morning, so no point in moving on. Cleared a bit by afternoon, so took a longish walk around to the other side of the lake and enjoyed yet more pretty views of it. Came to an adjoining lake, connected by a narrow passage, through which the lake ferry boat passes, watched by groups of contented cows. The hills around are very steep, and all along them are signs of the violent spring weather suffered by Austria, with big landslips and gravel landslides. Some had obviously obliterated the lakeside path in places, and had had to be cleared. Still cool in evening. Short chat with Brit couple with two girls in big and luxurious tent (once they had managed to erect it!). Still cloudy with invisible mountaintops, but we are out of food and must move on anyway. 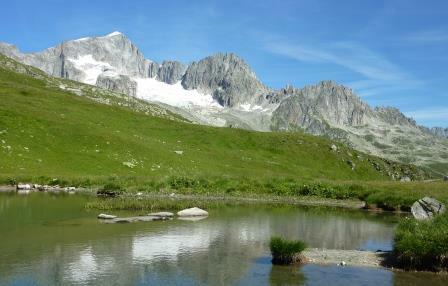 Started with a run down the Lech river valley, between the Allgauer Alps and the Lechtal Alps. The river has cut quite a deep gorge in places, and along other stretches where the valley widens there are classic Austrian scenes of green pastures backed by pine-covered hillsides. The fields are scattered not only with chalet-style dwellings but also with several times as many small wooden structures, apparently shelters for animals and storage for their fodder, but we could never properly understand what they were for. Some villages we passed through were especially pretty, with every guesthouse and dwelling competing for the finest finish and the most impressive display of flowers. Many of them are also decorated with fresco-like paintings, some in trompe-l’oeil. Another feature around here, and elsewhere in these alpine regions, is the prevalence of immense, but very tidy, stores of firewood, mostly alongside the houses but otherwise covered in their own shelters. We discussed here, and in many other places in central Europe, what the atmosphere be like in the winter when the air is still, while all this biomass is being consumed for heating. We took a short deviation to have a look at Lech, because the guidebooks describe it as an elegant mountain resort that takes especial care of the environment by restricting the number of buildings and amount of accommodation, all with the aim of keeping it exclusive. A selling point is that Diana, then Princess of Wales, was a regular visitor. What we saw was a normal ski resort, with plenty of ordinary-looking multi-story chalets in the outskirts and nothing special about the middle. Amazing what a reputation can do. We had been through some much more attractive places along the valley. On the last leg of our Austrian tour we then drove north-west up through the Bregenzer Wald (forest), a relatively untouched region where it is said that local customs flourish. This stretch starts with the 1,679-metre Schrocken Pass and then descends into a long valley that is famous for its wooden houses, with their outer walls clad completely in small heart-shaped shingles. We reached Bregenz then, on the shores of the small bit of the Bodensee – Lake Constance – that is owned by Austria. We were intending to stay at what appeared from the book to be a pleasant site on the lakeside, but what turned out to be a nightmare, large and packed solid with holidaymakers, many young people clearly intending to make the most of it. We checked in, drove around with difficulty, and then checked out again, remembering our resolution to avoid waterside or river-front camp sites in Europe in July or August! Driving back through Bregenz we came with relief across a quiet and pleasant-looking site near the town centre, part of a guesthouse complex including a hotel. So we settled in there. 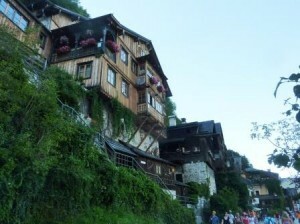 We decided to stay over for another day, and in the morning took a walk into the pleasant town of Bregenz. It was originally a Roman settlement, and during several turbulent centuries, as is typical in central Europe, it went through the hands of the Habsburgs before being destroyed by the Swedish during the Thirty-Years War. But inland from the lake there remains an old part of town centred on the Martinsturm tower, with origins in the 14th century. Adjacent is a simple chapel with some lovely frescos only recently discovered and dating from 1362. The 16th century old town hall has an amazing, high, half-timbered frontage. Down by the lakeside is a very different Bregenz. The city fathers have done a lovely job there. It was a public holiday in Austria (which we hadn’t known), and there were swarms of people walking through the parks, enjoying the swimming pools and having late Austrian-style breakfasts as noon was nearing. 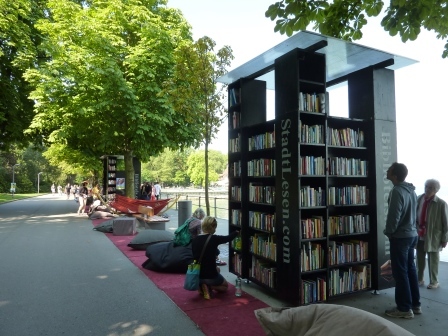 Along the walkway was a sight we have never seen before: people lounging on beanbags and hammocks just reading, with books of all kinds stacked in cases for anyone to pick up and read – the whole thing sponsored, we understand, by a hotel chain (Bibliotels) that does the same sort of thing in other resorts. When you see little kids enjoying their books while being cuddled by their parents in a large hammock, it’s kind of inspiring. 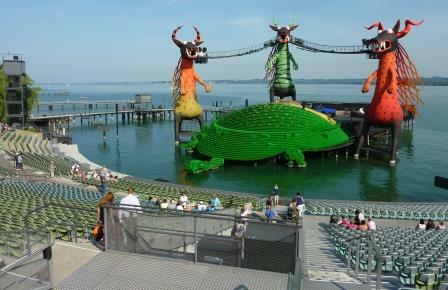 As Opera Australia subscribers and having been to both of the Handa operas on Sydney Harbour, we were interested to see the permanent “floating” theatre on the Bregenz waterfront. It claims to be the biggest in the world, but the temporary Sydney structure would play it close. Currently it was playing Mozart’s The Magic Flute, and we naively enquired about attending that evening. The whole season was sold out, we were told, a long time ago. There were ads around the theatre for next year’s opera. The trouble with touring is that you’ll never know, a year before, where you’ll be and when! We did see the possibility of at least hearing and seeing a bit of the performance from the waterfront promenade along from the theatre, and we saw some people apparently heading that way, but the probable crowding put us off. We didn’t like the look of the set anyway, which gave the impression that the production would be on the camp side of traditional. Back on the site, we did enjoy the sight of horses being exercised on a circular trainer. There were several horses in stables there, with their primary purpose seeming to be successfully competing in carriage events, if the trophies on the walls and the pretty little carriages in the stables were anything to go by. Waved through into Switzerland by disinterested border guards, and, via lunch at a very pleasant lake waterfront park, on to St Gallen. We tried a motorhome stellplatz on the outskirts, but the three official places were taken up by one large motorhome parked across the lot and it didn’t look much of a place to stay the night anyway. So we pressed on into the centre, and did find a spot to park. The rest of St Gallen was en fete, with bandstands being set up throughout the old town centre and the market square. Still visible were the fronts of many grand buildings of the 17th and 18thcenturies. The nearest camp site to St Gallen is about 7 km out of town, and turned out to be a quiet and pleasant grassy site by a river, enclosed by trees. Free wi-fi outside the reception. Switzerland these days seems like such a well-established and stable – not to say influential, especially in matters financial – member of the international community that it comes as a surprise that it was not until 1848 that a central government was formed and modern Switzerland was born. Its struggle for independence from the power and tyranny of the Habsburgs began in 1294, and wars between the developing Confederacy of Cantons and the Habsburg dynasty lasted for hundreds of years. Legend has it that the shooting by William Tell of an apple from his son’s head was in defiance of Habsburg power. The Swiss Confederation of Cantons became formally independent from the Austrian empire through the Peace of Westphalia. This treaty ended the Thirty Years War, and because the Confederation had not taken part, it ended up with a vibrant economy. The ending of civil conflicts between Catholics and Protestants finally brought about the 1848 constitution and a united country. The 26 Swiss cantons, now as then, have a substantial degree of autonomy within the Federal Republic. They and the individuals who live within them also have an astonishing degree of access to the democratic process. The country is governed by the Federal Assembly, including delegates from the cantons, whose President is the first among equals. Individuals or cantons, acting singly or in groups, who can garner sufficient public support can seek to introduce, amend or repeal any piece of legislation or regulation at the appropriate level, from speed bumps to EU membership. In WW1, despite or because of disputes between its German and French-speaking populations, the country remained neutral and offered asylum to tens of thousands of POWs and refugees. Between the wars it joined the League of Nations, but despite trying to retain a neutral stance it inevitably became politically involved through its arms industry and international finance. The German influence in Switzerland became problematic in WW2, and despite assurances of neutrality the nation’s banks provided financial assistance for the Third Reich by laundering gold pillaged by the Germans. In 1998 Swiss banks were pressured to pay $1.2 billion compensation to relatives of Holocaust victims, after it was discovered that the banks were holding tons of gold looted by the Nazis and assets once held by Jews who had perished. Just as after the Thirty Years War and WW1, Switzerland emerged from the second world war in good financial shape and somewhat detached from the turbulence of the reconstructed Europe. In 1971 it gave women the right to vote in federal elections, and in 2002 it joined the United Nations, but its membership of the EU still remains on the agenda only. Clear blue morning again, continuing a fine and sunny spell. Spent a couple of hours reviewing how best to tour Switzerland, taking into account where we had been before and also the difficulty with an obvious route because of the mountainous nature of most of the country. Rather than going up to the more industrial and flatter northern regions, we decided to go south first and back to the mountains. We were very kindly given a €17 guide to campsites in Switzerland by the lady in the office, and this would help a lot. 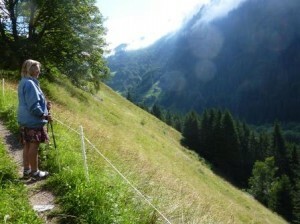 South, then, to the Appenzell region of countryside and traditional approaches to life. A little of this we were lucky enough to see, as we came across two processions bringing cattle down from the mountains, with herders traditionally dressed in colourful red jerkins, yellow trousers, white socks and flowery hats. The men were softly singing as they walked. In some villages we saw large groups of local people waiting for these processions. A friendly policewoman in a police car leading one of the processions told us that the ceremony of bringing the cattle down from the high country was early this year; this was because of the poor weather in the spring that had lengthened the winter, leading to a lack of fodder by late summer. We did indeed see that most cattle were showing their ribs. On our route we directly faced the precipitous face of the Santis massif, which we drove round in a loop westwards before joining the upper reaches of the Rhine and its valley down to Chur. On our way we saw a colourful array of vintage and classic tractors laid out in an orchard, and enjoyed wandering round this most interesting collection of colourful machinery. There were a couple of small John Deere tractors of the thirties among the predominantly fifties collection of tractors from the Eastern bloc countries. Chur, at the head of the Rhine valley, is a crossroads town, linking the north-south and east-west routes through the Alps. It was a bishopric until the Reformation, when its rule came under the secular merchant class, and it is now capital of the mountainous canton of Graubunden. We settled in a motorhome park outside but attached to a large camp site, which was unattractively packed solid with permanent caravans. We felt comfortable outside in our stellplatz, and still had full access to the sanitary facilities if we wanted them. To east and west we were overlooked by ranges of mountains with cliff-like faces. A very peaceful night, as this is quite a remote little corner of the town – very busy with walkers and cyclists in the day, though, as tracks for both run between us and the stony upper reaches of the Rhine, starting on its journey all the way to Rotterdam and the North Sea. The various upstream tributaries finally join and get the simple name “Rhine” about 10 km west of Chur. We had been told at check-in that the town’s annual festival – the Churer Fest und Alpenbarttreffen – was this weekend, so we took the bus in to see the sights and what was happening. Not much, in mid-morning, so in relative quiet we explored the cathedral, walked around the old bishop’s palace and through the attractive pedestrian-only old centre. By lunch-time things were humming, with scores of food and other stalls doing good business. All the efforts were by local community, social and sporting groups, and it was clear that many people in the throng knew each other. 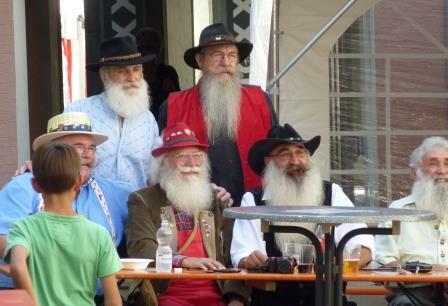 The “Alpenbarttreffen” is a contest for the most bizarre and beautiful Alpine beards, and many men sporting their efforts were wandering around and – like the majority of other men – were enjoying large quantities of beer. It did appear, and was confirmed, that Heineken is a major sponsor of the festival! It was hard to find a food stall that was not packed and did serve food that we wanted, but we found one serving pizzoccheri, a local buckwheat pasta speciality which was very good along with the Chur-made Calanda beer. We shared one of the open tables with Karen, a lovely young charity and disability worker who lives in the town and gave us some insights into living in Switzerland. She came with us in what for us was a return visit to one of the many bandstands, where a chamber orchestra was playing classical music with a distinctly Swiss tone. Back to the van by bus and then reading in the sun. After dinner, a walk in the dusk along the upper reaches of the Rhine, running within a few metres of us, so see if we could see the local “ool” (? ), or eagle owl. We came across a pair of bird-watchers with a powerful telescope, and although we could hear the birds’ call we couldn’t see them. Rather to our surprise, as we had not been following any forecasts, rain started shortly after dark and continued off and on all night. There are several choices of route out of this crossroads town, involving selection of types of scenery and the extent to which we want to retrace roads we have previously travelled. The weather was probably going to stay miserable today, so we chose the simplest route out to the west along the Rhine valley towards Andermatt, along which there were a few camp sites we could dive into depending how bad the weather got. Despite the continuing showers we had a pleasant run, rejecting one site that was jam-packed full of caravans converted into holiday homes, and a few kilometres further on dived down into the steep-sided valley at Disentis Muster, from which we could see a pleasant-looking site down by the river. The site is one of a chain run by the Touring Club of Switzerland, the main automobile club, and was the second we had been into. Not the cheapest (nothing is cheap in Switzerland), but with outstanding facilities (free wi-fi of course) and a beautiful location. We walked a little way along the Rhine, still a small fast river running over stony beds as it was in Chur, where a few optimistic enthusiasts were panning (of sorts) for gold. Showers continued off and on all day, getting cooler all the time, even by the standards of our altitude of just over 1,000 metres. Our plan for the next leg takes us over two high passes, so we want the skies to clear. More rain overnight, but stopped by morning, blue skies with cloud. Quite a stiff walk in the morning: first, a climb up a steep path from the site to the small town of Disentis Muster, up the side of the valley. Not a lot there, but “Muster”, the Romansh name of the town, is derived from the Greek “Monasterion”, and it is the monastery that is the main thing to see here. It sits just above the town on the hillside, and is an imposing building with twin church towers. It holds 30 Benedictine Fathers, Brothers and novices, who run the administration, maintenance and a school (which includes girls). The original monastery was founded in 750 AD, based on a cell established by the monk Sigisbert in 700, but since then has been destroyed many times. As seen today, the Baroque monastery was built in the mid-17th century but had to be rebuilt following destruction by the French in 1799. 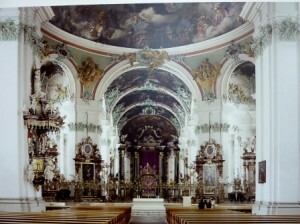 The church is lovely, with a light-filled white interior trimmed with baroque gold decoration and an array of paintings, notable among which are a series in the ceiling arches that tell the tales of Saints Benedict, Sigisbert and Placidus (who, following his martyrdom, presented his own head to Sigisbert – this was unusual, we thought). Just beside the main church is a little one dating back to 980, the massive altar being the original. A longer but gentler downhill walk back to the site, and reading in the sun in the afternoon. Cool post-frontal north wind blowing along the valley. Military helicopters in substantial action during the afternoon. Switzerland’s status of armed neutrality means that it does have a defence force, land and air, manned mostly by male conscripts and female volunteers. Each year about 20,000 young recruits receive three weeks basic training. The effective reserves number about 200,000, with about 120,000 undergoing annual military training. As is well known, trained personnel are required to keep their weapons at home, a system supported by Swiss opinion that has not contributed to blood on the streets. Clear blue skies and very cold by our standards, with frost on the grass by the van. Cleaned up and watered, then away on a very beautiful run under clear blue skies south along the Val Medel, classic Swiss scenery, rolling green foothills arcing up to steep mountainsides, with snowy peaks ahead. The road crosses from the canton of Graubunden to Ticino, the Italian canton, over the 1,916 metre Lukmanierpass or Passo del Lucomagno, depending on what language you speak. On the southern, Ticino side, the hillsides in contrast become thickly forested as the road winds down through the Val Blenio. We followed the valley down to the town of Biasca, for a supermarket for some stocking up. We found ourselves effectively in Italy, with all road signs and other signage in Italian, and Migros supermarket staff also speaking the language – a bit of a relief after all these weeks trying to cope with German. Returning towards the north and the small canton of Uri, we tackled the St Gotthard pass as something of unfinished business. In 2001, when we bought our 1987 Ferrari 328 in the UK and toured Europe with it, we had intended to take the road over the pass but missed the turn from the motorway and had to endure one of Europe’s longest tunnels in our open car, shared with hundreds of heavy, smoky, noisy trucks. It was easy to miss the tunnel this time because we had not purchased a motorway vignette and thus had to stick to non-motorway roads, one of which took us straight up the road over the pass. 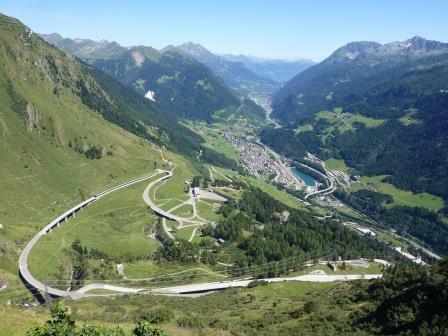 The St Gotthard is the principal route between northern Europe and Italy, and has existed since the 13th century. Both the tunnel and the pass road carry a large amount of traffic, and the approaches from the south are through village after village of no special charm. Even this time we did not do exactly what I had in mind, which was to take the very original, first road over the top. 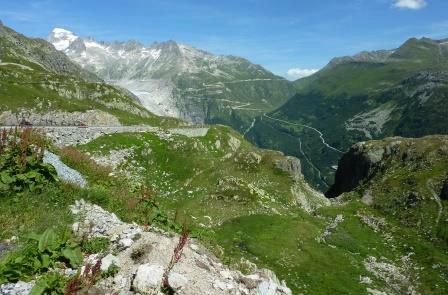 But this is now little more than a goat track, over cobbles, and as seen from the top of the pass is one of the most convoluted and narrow in the alps. We took the newer and well-engineered road, a comparatively easy drive to the top, at 2,108 metres. As usual, there were throngs of keen walkers climbing higher, to the several higher points around. The descent to the north was more attractive than the climb, and we made the final run down to Andermatt with ease. We pulled into the “camp site” in Andermatt, the only one in the area but what is really simply part of the car park for the cable car that is roped off and where it costs 30 CHF ($30 Oz) to stay the night. For us, Andermatt had a reputation as one of the glamour spots in alpine Switzerland, but we were puzzled why it didn’t appear with any prominence in any of our guide books. Sure enough, as it is now, it is simply an alpine ski resort of no special note or charm, and extensive rebuilding of its centre did not increase its attraction, for now at least. It was quiet, as are all such towns and villages for the time being, in what for them is the off-season. Found the post office to get a postcard away to much-loved relatives who do not have a computer; a process that embraces finding and buying a suitable card, going back to the van and writing something, finding a post office for a stamp, and then posting it. This takes days, as we praise the benefits of email for communication, but probably also shows our certain lack of organisation in regard to snail mail. Another glorious, clear, blue, cool morning. We are still at 1,444 metres, as we set off for more pass-climbing and mountain scenery. Off to the south-west, gradually climbing along the Furka valley, for a short time following a magnificent coach drawn by five horses, taking tourists for no doubt a considerable sum on an impressive ride into the mountains. A most beautiful run, then, along a wide river valley, narrowing and becoming steeper-sided as we approached the Furka Pass. This is one of the highest alpine passes, and is narrow and steep in places with several hairpin bends as it climbs up and then down to the village of Gletsch. Every bend brings yet another picture-perfect view, whether down into the valley or up towards craggy peaks all around. The hillsides were coated with thick green grass, most rock faces were shaded green with algae, and the rocky upper slopes were speckled with snow. There were several herds of cows in the high meadows, but we failed to catch sight of any of the marmots that are supposedly common up here. We went for a walk around the 2,463-metre summit, and sat beside a lovely little lake for a while gazing up at the Rhone Glacier, which sits high above Gletsch and its confluence of roads. It is the source of the great River Rhone, and in 1961, touring in my father’s Mini, we were able to reach its extremities and walk through tunnels in the ice. In the subsequent 52 years its face has retreated too far to be approached except by some pretty strenuous hill-hiking. Down then through a further series of dramatic but well-engineered hairpins to Gletsch, and a right turn to start the ascent of the Grimsel Pass. The 3,530-metre Dammastock mountain, with a snowy peak and from which the glacier flows, is totally surrounded by a ring of lovely roads and splendid passes: the Furka, the Grimsel, and the Susten. A fourth, the Oberalp, is on the approach to this ring. It is one of the very loveliest parts of the world, in our experience, if you like mountains. The Grimsel has been re-engineered more than the Furka, but is still another marvellous climb up to the summit of the pass at 2,165 metres. On the way up we could see to the west the peaks of the Bernese Oberland, which would be the next stage of our travels. Again we walked around the pass summit, and thus came across a sign pointing to a motorhome parking and overnight place. It was hidden round a rocky outcrop, and we pulled in, chose a prime position, and enjoyed bright sun for the rest of the afternoon. We were later joined by two large and one small van, and a young couple on bicycles with a tent. To our left we overlooked a blue lake and the dam that holds it there, and to our right we could see the summit of the Dammastock mountain and the Rhone Glacier. Glorious. As the crow might have flown, we had travelled the grand distance of about 20 km from Andermatt this day, although a lot further on the road. And now we looked forward to camping at 2,167 metres according to the satnav (over 7,000 feet), a record for us. We anticipated a cold night, once the sun went down! A good peaceful night, no storms or other dramas, and not as cold as we feared. Yet another great run early, this time the descent of the Grimsel pass. A feature of this leg was the large number of dams and consequential large lakes in the high country. Switzerland generates 56% of its energy from hydro, and 39% from nuclear power. This means that it easily complies with all treaties seeking to reduce CO2 emissions. The descent was through the north side of the mountains, and the topography was much more rugged, with few green fields but lots of green algae on the rocky slopes. As we approached the Brienzer See, the eastern of the two lakes straddling the town of Interlaken, we took a small detour to consider having a look at the 100-acre Swiss Open Air Museum at Ballenberg. We have been to similar museums elsewhere, where dwellings from all over the country are reconstructed on site and they and associated activities are brought together to represent regions and cultures over the ages. From pictures, it looked as though this museum would look much the same as a typical rural village in Switzerland, but we do like looking round the interiors and seeing how people lived. However, on approach the large car park was full, buses were abundant, and it was clear that this was a big (long) day out for thousands of locals. It wasn’t cheap, either, so we gave it a miss. After a lovely run along the north side of the Brienzer lake we came to Interlaken looking to do some restocking, particularly of wine, which was in dangerously low supply. But we wasted time looking for a non-existent Lidl (my fault), and unable to stop at other shopping places in busy urban centres, we went on through and down the valley to the south. This was to get to Grindelwald, and a camp site that lies right under the north wall of the Eiger mountain, the Eigernordwand. Perhaps because neither of us is that keen on unprotected heights, we like reading about climbing, and of course the notorious history of attempts to climb the north face. Tomorrow we take on part of it by train. We just hope the weather holds for long enough to make the trip worthwhile. Today has been pretty good, but as I write the top of the Eiger is swathed in cloud and the forecast for later this weekend is poor. Awoke to clear skies and the sound of the alarm clock at 6:00 am, and walked to the local train station for the 7:25 train up to the last station on the first part of the ascent, Kleine Scheidegg, at 2,061 metres. This was the first departure on the timetable, not only offering a substantial discount from all later rides but also we hoped – as it turned out rightly – to be freer of crowds up the mountains and more likely to avoid deteriorating weather. This is a narrow-gauge cogwheel track, and the train slowly wound its way up the steep slope on the flank of the green valley below the Eiger north face. There were unsurprisingly fantastic views of the rock face on one side and the valley to the other. This was an amazing-enough ride on its own, but at Kleine Scheidegg we changed to a smaller train, again climbing on cogs, that would lift us another 1,400 metres or so. We then encountered an outstanding feat of engineering, because the train line enters a series of tunnels within the very rock of the 3,970 metre Eiger and its immediate neighbour, the slightly higher Monch. At two places the train stops for five minutes to let passengers alight and walk a short distance to galleries cut into the Eiger face. A truly amazing experience. Like other campers we had observed a light high up on the face the evening before, and thought it was an intrepid climber bivouacking; but in fact it was one of these lookout points. 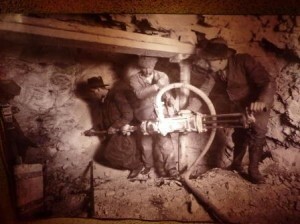 The tunnelling was the inspiration and vision of Swiss entrepreneur Adolf Guyer-Zeller, who was granted permission to go ahead by the Swiss federal government in 1894. It took 16 years and 30 deaths among labourers (chiefly Italian) to complete this astonishing project, and the final cost was only double the original estimate – pretty good, by today’s standards. The train finally comes to a halt in a station embedded in a ridge between the Monch and the highest mountain of the trio, the Jungfrau. 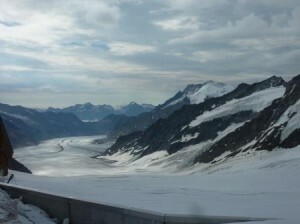 The station and the facilities also built up there are known as the Jungfraujoch, billed and branded as “The Top of Europe”. From near the station we took a fast lift up another 111 metres to a 3600 system of terraces, with some protected by glass and others open to the winds and weather. They are at 3,571 metres, or about 11,800 feet, and just below the snow-covered summit of the 4,158 metre Jungfrau right beside us. We were greeted by clear weather with some high white clouds, a very light wind, and a temperature of 20 C. The views all around are almost beyond description. From the ridge we could see over to the “other” (south) side of the mountain range, where the immense 22-kilometre Aletsch glacier complex, the largest in the Alps, winds its way down before dividing to go each way round the Aletschhorn mountain, another peak of over 4,000 metres. On the north side we could look down at the near-vertical, concave north face of the Eiger. The first ascent of the Eiger mountain was by a Swiss/Irish team in 1858 via the west flank, and the north face was first scaled in 1938 by a Austrian-German expedition formed by two pairs who joined up on the way, and was led by the experienced Anderl Heckmair. His chosen, and famous, way up the face is known as the Heckmair route. Many have climbed it since then, but since 1935 at least 64 climbers have died attempting the north face, earning it the German nickname, “Mordwand”, or murderous wall. Part of the climb’s fame lies in the ease of viewing climbers’ death-defying struggles through telescopes at Kleine Scheidegg. The challenge now is for the fastest, solo, unassisted climb. The astonishing record is held by the Swiss Ueli Steck, who climbed it during the 2008 winter in 2 hours 47 minutes. A short documentary film of this ascent, shot mostly from a helicopter, was shown in the train while we were in the tunnel to the top. Below the high terraces we walked out on to the hard-packed, icy snow at the top of the glacier, and I regretted not wearing better walking shoes when I fell flat on my back while chasing a better camera angle. 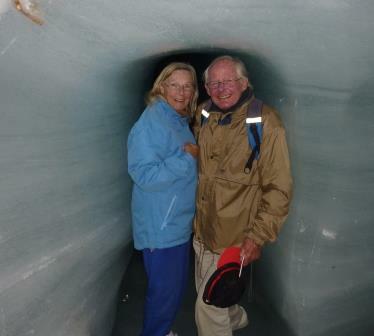 It is possible to descend into the solid ice, where a series of tunnels were cut in the 1930s. There are some rather kitsch but quite attractive ice sculptures, but it was fun to walk carefully (!) down the ice tunnels and through more open caverns where tourists spend a great deal of time photographing each other (including us, I should say). Fortunately, for this whole expedition we had successfully stayed ahead of the tourist hordes, as hundreds and hundreds were now emerging in places that we had had almost to ourselves. An early arrival at the most popular tourist attractions has always been our strategy, where possible. On peak days, we read, the trains carry as many as 5,000 passengers to the peak. We were surprised by the large number of Japanese in tour groups, something we have become aware of elsewhere in Europe this year, along with a diminution of European travellers. There is a research and weather station up at the viewing terrace, and the previous evening we had been able to obtain a forecast from that very place on the internet. The indications were for a clear morning, clouding by noon, and heavy clouds, rain and perhaps snow in the afternoon. This turned out to be dead accurate, and as we headed back down to the train we could see the clouds moving in. Then came another surprise: the ticket inspector told us that “technical problems” had forced the suspension of the Kleine Scheidegg-Grindelwald train, and that we would have to take another route down from Kleine Scheidegg. We weren’t too fussed about that, as I had seen that it was possible to take a circular route from Kleine Scheidegg to Lauterbrunnen and descend through different, steep-sided valleys back to Grindelwald. So that, in the end, was exactly what we had to do, with a different set of views of the mountains, particularly of the Monch and the Jungfrau. With a few delays waiting for trains we finally got back to the van in the afternoon, having taken about a couple of hours longer to get down than up, but with no regrets. Our timing for the day continued well, as heavy rain and a thunderstorm started just as we reached the van, after a bit of drizzle earlier. The mountaintops we had so much enjoyed were completely encased in cloud. 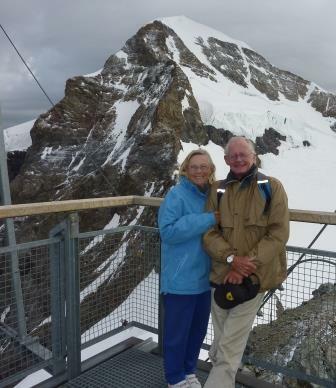 It is not an inexpensive trip to the Jungfraujoch, as one of our guidebooks says, and we were glad our money was in the end well spent. With the ballooning in Cappadocia, this has been one of the great experiences of this year’s travels. Running out of provisions as basic as bread, eggs and wine, the first priority of the day was find out whether anything was open, preferably a Lidl. So up back to and through Interlaken and a very pleasant run along the north side of the Thunersee, the western of the two lakes. On our way we spotted the lakeside hotel where we stayed with the Ferrari in 2001 – it looked closed. 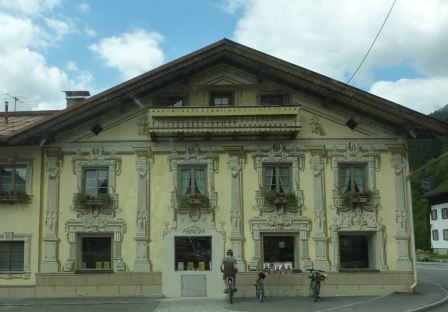 Up to the big town of Thun – but sure enough, all the big stores were shut, being Sunday. In the back streets we did find a little bakery where we were indeed able to purchase some bread, eggs and wine. Drive of the day was down the Simmental, the long valley of the River Simme, and we tracked along through the many pretty little villages in yet another picturesque Swiss valley alongside the fast-running river. In the early afternoon we made an early stop at a camp site in Zweisimmen, from where lots of lifts take skiers and walkers up into the mountains. Not much of a site, being 90% permanents living in what appeared to be their “mobile” homes, but it did have wi-fi and we followed the Belgian GP on the Live Timing iPad app. Watched this way, it didn’t appear to be a very exciting race, Webber having made a crook start as usual, but we’ll read the reports tomorrow. Weather remains gloomy, with showers by 6:00 pm. We think the holidays may be over this weekend, so the following weeks should be quieter and the visits less crowded. But we do prefer to see the sun! Pleasant morning run down through several ski resorts and past arrays of chalets on the hillsides, and a turn down on the road through Gstaad. This is one of the best known and most prestigious resorts in the country, well known – as his readers in the Spectator will be aware – that this is the only resort of sufficiently high class these days for Taki’s taste. To us, with no real knowledge, it looked like any other very attractive resort, aimed mostly at winter sports, and with local controls over the height, density (and status?) of buildings. After that glimpse through a window into high life, it was down into the lowlands for us, and the eastern end of Lake Geneva. 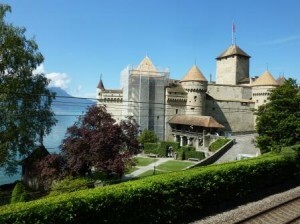 We made a stop there to visit Chateau de Chillon, and as chateaus have not figured as much as usual in this year’s travels, we were very glad we did. The castle sits on an outcrop of rock at the very eastern end of the lake. It was built for the Dukes of Savoy in the 11th century, but since then it has been remodelled and reconstructed many times. Its present restored appearance dates from the 13th century, following fine research by a dedicated team of local archaeologists and other experts. It lies, inevitably, in an important crossroads position, and has the classic appearance of a medieval fortress. The keep, or Bergfried, is the centrepiece, and is protected by two layers of defensive wall on the land side and extensive state rooms and more defences on the lake side, where the rock face down to the water is vertical. There is a marvellous view of the lake from all the battlements and towers. Within, state and domestic rooms have been beautifully restored and presented, not overdone, just enough to give a good feeling of how things were. The best route through the castle is well but discretely signed, and the explanatory plaques in all places of interest are exceptionally well done, in languages including English. The castle was also used as a prison, and in the 16th century Francois de Bolivard was held in its underground vaulted chambers. He was the hero of Byron’s 1816 poem The Prisoner of Chillon, and Byron inscribed his own name on one of the pillars. From the castle, just along the north side of the lake we drove through Montreux, famous for its music festivals, Vevey and Cully, whose reputations rest on wine – there are extensive terraced and very Swissly neat vineyards on all the hillsides around – and on to Lausanne. Taking our chances, we dived into the city centre to have a look at the cathedral, and were lucky enough to find a spot just a short walk up the hill on which the church stands. It was built in the 12th and 13th centuries in classic French Gothic style, although at the less ornate end of the spectrum. It was consecrated by Pope Gregory X in 1272, but what makes it interesting now is that following the Reformation it became a Protestant church. 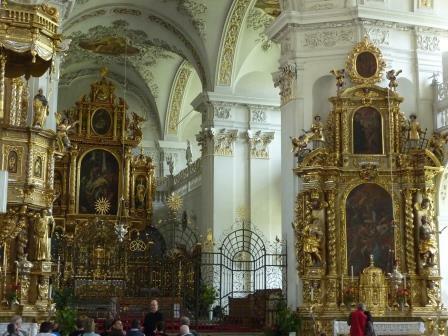 Hence, compared to the average Catholic church of equivalent eminence it is remarkably austere and undecorated inside, and free of the typical Catholic iconography and statuary. It does have some excellent carvings in the masonry, however, showing its theological origins. We needed to spend up our remaining Swiss francs, so instead of going through to France this day we chose to stay in our last Swiss camp site. After some problems finding the place, near Vallorbe, and not being helped as much as usual by the satnav, we came across an excellent little site by a river, close to the border, not crowded and with only a couple of permanent caravans, and with good free wi-fi at the van. I woke up with a very sore throat and fears of an impending cold, with likely infection dating from the Eiger-Jungfrau experience. But not too sick to drive, so before leaving Switzerland we thought to have a look at the Fort de Vallorbe, up in the hillside behind the town. This was built in the 1937-41 period as one of several such warning and defensive positions in the event of a German invasion. In the event, of course, Hitler “respected” Swiss neutrality (indeed, the Nazis did very well out of it), but these facilities were very comprehensive. There were several layers of defence and comprehensive underground tunnels and chambers holding, armaments, stores and hospitals. 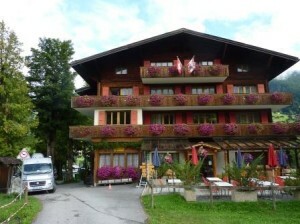 In this case the whole system was topped by a concrete bunker built and painted to look like a typical Swiss chalet. However, when we got there at the appropriate time documented in the tourist literature there was no-one there to open up and take us around, so we never did see inside. From there it was a short run to the French border, which we swanned through without even flourishing our EU passports. We always feel comfortable coming back into France. Its present political, economic and social problems seem remote to the travellers who get so well looked after – and among those looked after better than in any other country are those in motorhomes, or camping cars, as is the French generic term. I was not feeling too brilliant by this time, and we soon pulled into an example of what makes touring in France so great for us. 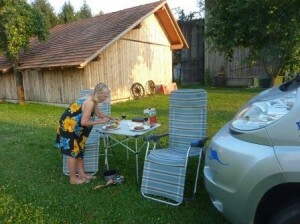 By the side of a lake sits the village of St-Point-Lac and an excellent “Aire de Camping Car”. These are usually provided by local authorities but sometimes by private enterprise, and are special areas (aires) providing services for motorhomes in the form of overnight parking and/or provision for water and disposal of waste. There is occasionally electricity provided, or toilet facilities, but the basic principle is that the vehicles should be totally self-sufficient. This does not include caravans towed by cars. The benefit to the local community is that motorhome users are consumers of local products and services, and are therefore welcome. The principle has expanded through Germany and Italy and to a lesser extent to Spain, Portugal and a few other countries. In some countries, notably the UK, such facilities are essentially prohibited by regulation. It’s a full-service camp site or nothing. This harks back to the time when tourers were almost all using caravans, which were towed to a given reserved location for the holiday and the tow car then used for touring the area. 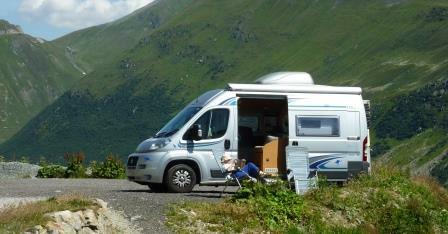 Motorhomes are mostly not used that way: users relish the freedom to get up and go off somewhere else every day or two, with no bureaucratic checking-in and checking-out, and often without much of a closely defined itinerary. Local authorities who complain about motorhomes clogging up their villages and beaches simply have to provide a dedicated parking area for them, at reasonable or no cost, and enjoy the income that flows from them. Here endeth the polemic. So, here we are parked right by the rushes at the lakeside, with pretty green hills rising from the other side. There is a tiny harbour for small sailing boats and a children’s playground nearby. The cost is €7.50 per night, we can buy basic provisions from a full-service camp site 100 metres away or walk into the village, there are sparkling clean toilets, and our aire is shared by many other motorhomers with a similar view on freedom and flexibility. We can hear the sounds of cows and cowbells from a mammoth cowshed a couple of hundred metres on the other side of us from the lake. This suits us well. With my cold well developed, and with memories of a time in central France many years ago when it developed into full-blown bronchitis, we decided to stay put and have a quiet time of it. The weather was not brilliant anyway, with lots of clouds between periods of sunshine, and showers by evening. Basically, just relaxed and waited out the worst of my cold. Took one short outing round the lake, simply to find a pharmacist with cough suppressant. Did get some local produce from the dairy shop. This is a very pleasant aire, with a lovely outlook, and a good place to take it easy for a day or two. Well enough to get moving again, and first up to Pontarlier for some basic stocking up at Lidl. We were aiming to take a scenic route up towards Belfort, but the road was blocked off and we had to take a long detour through some busy farmland in the Haut-Doubs valley, approaching the hills of the Jura. We took an early-afternoon halt at an aire in a little area called Le Cirque de Consolation, a jumbled mass of crests and steep valleys. 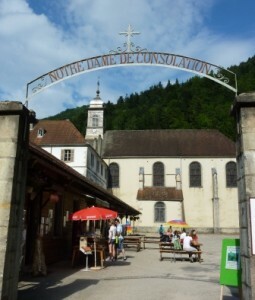 In the tiny settlement of Consolation Maisonnettes, at the bottom of one such valley, lies what was once a monastery dating back to the 16th century and is now a place of respite and spiritual retreat supported by the Artisans de Paix Consolation. One of its UK-based projects is the provision for those previously convicted of violent crime to come and contemplate the effects of their actions on others. Apart from the aire (with power supplied) and a little camp site for tents, within the ex-monastic grounds there is a massive botanical park, a small boutique shop selling local produce, and a cafe. The chapel is still active as such. We knew nothing of such a place before finding the aire through one of our guidebooks to such things. Cool in the evening after the sun disappeared over the mountainside. We will explore more tomorrow. A misty cool morning, so after Norma had got some rather heavy local bread from the baker at the monastery, we were away cross-country from Consolation, this rather weird and remote little corner of France. Gradually climbed over the north-east end of the Jura range, mainly through forests and logging country – being sympathetically done, as far as we could tell. Then down quite steeply to the pretty village of St-Hippolyte and along the valley of the Doubs to Montbeliard. This was latterly a pretty uninspiring run through industrial land and the big city itself. We bypassed the centre to the east, where in the suburbs the Peugeot family established their original bicycle factory. They then started making steam tricycles in 1889, the start of a car-building empire carrying their name. We came then Belfort. We hadn’t been to Belfort before, but had passed it by on at least one of our passages south through France. The guidebooks seem to differ on its importance and attraction: Michelin gives it a good rap, the Eyewitness gives it a short description, but the Lonely Planet we have (an old one) doesn’t even mention it. What we did establish was that it is a nightmare to navigate right now, because a large part of the centre is being dug up. A combination of a succession of diversions and one-way streets caused Kate Tomtom to send us in circles. But it was a Sunday, so we gained the middle finally and found somewhere to park, probably illegally. Belfort, as its name sort of implies, lies in a very important position strategically. It lies between the Jura to the south and the Vosges range to the north, on the east-west route known as the Belfort Gap. Through the gap have ridden successive waves of invaders, including Celts, Germanic tribes, and soldiers of the Holy Roman Empire. In the 17thcentury the great French military engineer Sebastien Vauban built one of his 33 immense citadels here, enclosing the town with a defensive wall and building a fortress high on a rocky crag overlooking it. 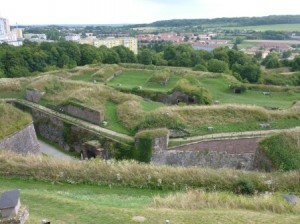 It withstood sieges against German forces in 1814-15, and during the Franco-Prussian war of 1870, 40,000 German troops were held up at Belfort, with the commanding French Colonel Denfert-Rochereau retiring to the castle and withstanding a 103-day siege before finally being ordered to surrender with honour by his government. Following its humiliating defeat in this conflict France had to cede Alsace and part of Lorraine to Germany, but Belfort escaped this fate and instead became the centre of its own tiny territory, the Territoire de Belfort. 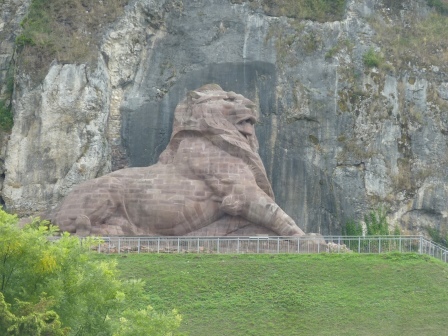 The spirit of 1870 was made manifest by the enormous figure of a lion, carved in the red sandstone of the region in the face of the cliff under the castle facing the town centre. It was the work of Colmar sculptor Frederic Bartholdi, whose other great creation was the Statue of Liberty in New York Harbour. This was all very interesting, and views over the surrounding countryside from the Jura to the Vosges absolutely marvellous, but we got the feeling that tourists from out of town were expected to make their own arrangements. Quite apart from the roadbuilding, navigating round the town was hard, and it took ages to find the small road up to a nearly empty car park up near the citadel rather than tackle the very substantial climb up from the town centre. My now-bronchitic chest, unfortunately, and Norma’s knees, were not up to it this day! For the night we drove out into the countryside to the east and to a very pleasant little aire near Montreux-Chateau, a village on the canal that links the rivers Rhine and Rhone. 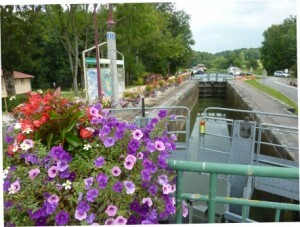 A set of locks were right across the quiet road from us, decorated by planter-loads of colourful flowers. Not much boat movement, though; the season is indeed coming to an end, confirmed by increasing cloud and a splash of rain. Dawned blue and clear as it happened, and in the morning we went for a very pleasant walk along the canal side, everything quiet and peaceful. The afternoon continued pleasant, and we sat in the sun or under the shade of a tree. A handful of boats did go through the locks, which is always fun to watch. Decided to get moving, as my chest – suffering the after-effects of the heavy cold, despite all attempted preventive measures – did seem a bit better. Through some attractive farmland then, en route for the Route des Vins. This runs up the east side of the Vosges, and we have not taken it before; we have however, twice taken the Route des Cretes, which runs along the crests of the hills and is a great drive. 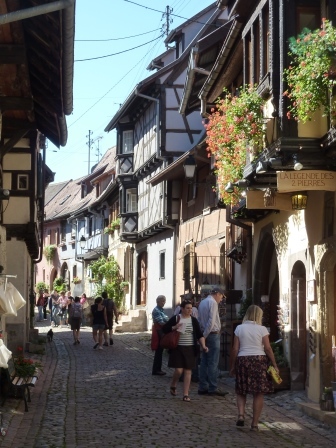 The first village we stopped at was Eguisheim, fair thrumming with tourists. 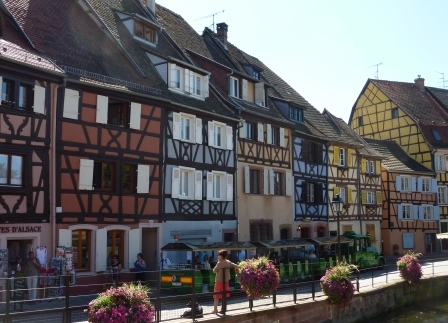 It is an enchanting place to wander around, with medieval dwellings, public and commercial buildings all half-timbered and in multiple pastel colours. The rendering between the timbers has been filled out to the depth of 25 mm or so, which gives the colouring something of a three-dimensional look, especially in the slanting sun. Masses of flowers adorn every window sill and balcony, as well as the little streets. The near-circular village is enclosed by a double row of residential ramparts, all well preserved. It’s all undoubtedly extremely picturesque, but our sceptical eye noted that it was nothing like that in medieval times: there was no raised rendering, the buildings were a nondescript buff colour, and it is doubtful that much time was spent garlanding them with flowers. In one of the excellent explanatory plaques this is all made clear, showing how the austere originals morphed into the colourful tourist attraction they are now. This decoration is all a 19th and 20th century affectation. We had a plan to visit the Ecomusee d’Alsace, one of the biggest tourist attractions in the region, but contrary to the guidebook directions, it turned out to be shut on Tuesdays. French opening and closing hours and their relationship to seasons are one of the few frustrations of this country! In this case, at the entrance gate we were advised to check their web site for opening times! 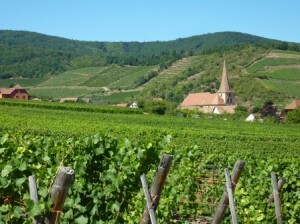 On up the wine route and through Turkheim up a steep winding hill to Les Trois Epis to get among the vineyards. A splendid little drive, and when we returned to Turkheim having completed a loop through the hill we found that this weekend there is to be a round of the French hillclimb championship, including runs for classic cars. But our time was running out, and we couldn’t stay for that. In Turkheim there were several places for motorhomes to park free, and we ended up in a small car park by a sports ground and bizarrely close to a railway line. But the trains were not common, stopped running at night, and were mostly very quiet single-car commuter trains. A walk round Turkheim showed many of the attractive features we had enjoyed at Eguisheim, and it did also have an interesting little museum, the Memorial Museum of the Battle of The Colmar Pocket. This obviously started as the collection of a bunch of war history enthusiasts, because it was mostly a collection of weapons and uniforms, with some excellent little dioramas, but the interest lies in the story it tells, the battles for the Colmar salient. In 1944-45 General Patton, despite being chivvied by Eisenhower, had his eastward advance through the Belfort gap and Colmar ground down by the exceptionally cold and wet winter. His vehicles were brought to a halt in the mud, and the German defence was determined. The displays illustrate these features of the campaign, but not the storyline very well, and most of the explanations are in French. We took the local train into Colmar. As I have found in France, where anywhere else in the country both my Australian credit cards are accepted without question, they don’t work to buy railway tickets, whether in the national SNCF system (as here) or the RER in Paris. As there is rarely any other alternative to a machine to purchase a ticket, and many machines don’t accept cash, the only practical option is to hop on and hop off without paying, which is what we did. 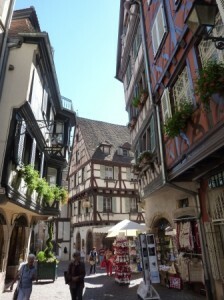 The ride is only 10 minutes to Colmar, a 3-star Michelin destination and a very well-preserved city of Alsace. Close to and linked with the Rhine, the town has prospered since the 13th century on the proceeds of the wine trade. Its heyday was the 16th century, when wine merchants shipped their produce through the canal that deviates from the River Lauch and pierces what is now the old city in the area known as Petite Venise, a gross exaggeration of a name! Still, it’s a very pretty location in a highly attractive town. We actually toured the old town twice, the first time taking for the first time in our lives the touristically typical Petit Train. This, as they all do, presents a once-over-very-lightly view of the major sights, with a commentary via headphones in a language of your choice. In the afternoon we went back and walked most of it. The major attraction and an important reason for our visit was to see the Musée d’Unterlinden, which is housed in a 13th century former monastery and is world famous for the Rétable d’Issenheim. This altarpiece is one of the most dramatic and emotionally intense works of art ever created. 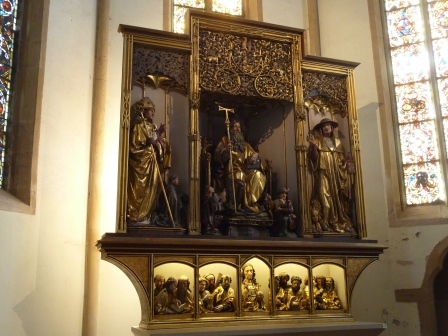 The basis of it is a set of carved and gilded wooden figures by Nicolas of Hagenau in the late 15th century. 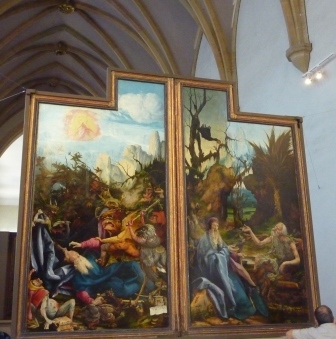 These can be covered by a triple-layered set of wooden panels and wings, with paintings depicting scenes from the New Testament painted by Matthias Grunewald in 1511-16. On arrival at the monastery we were dismayed to learn that the whole altarpiece was under restoration, and could be displayed in its original location. Well, we thought, we’ve come a long way to see this, so in we went. What we had not understood was the complexity of the piece. The underlying set of carvings was in its original place, at the head of the monastery chapel. All the doors and wings had been removed and separated, and they had all been set on stands ranging down from one end of the chapel to the other. A brilliant model on the wall, that we could play with ourselves to see how the sets of leaves and wings worked together, gave an understanding of the piece as a whole, and each real panel could be approached closely to examine the extraordinary detail of the paintings. We could also watch a restorer working on a panel, millimetre by millimetre, taking photos as he went. A detail that caught my attention was the cartoon-like depiction of the faces of the characters crowding round Jesus as he faced Pilate and jeering at him in his last hours. They were drawn as the archetypal Jew in a style that would have done Goebbels proud, and was a dramatic demonstration that anti-Semitism in Europe goes well back through the Middle Ages. Seemed a long walk back to the station, and had to wait nearly an hour for the train because we hadn’t checked the timetable, but we were still back at the van by 4:00 pm, time enough to relax in the sun. North again, and to start with further up the Route des Vins through vineyards on the slopes up the Vosges to the left, and the flat valley of the Rhine to the right. 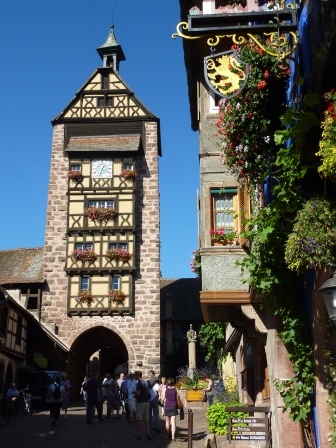 We had yet another flowery village to “do”, Riquewihr, the most famous one on the route and regarded as the prettiest by one of the guidebooks but as Disneyland by our favourite motorhome blogger. Bit of both, really; very attractive, as they all are, with masses of flowers as advertised, cobbled alleys, galleried courtyards, ramparts and watchtowers – but with busloads of tourists attracting some of the worst kinds of tourist tat shops competing with sellers of genuine local specialties such as nougat and other sweets. Further north and tending west across the upper end of the Vosges we were in hilly, wooded terrain again, with roads twisting and turning. We took a small deviation to view the Chateau du Haut-Koenigsbourg, which is the most popular tourist attraction in Alsace. It is perched high on a hilltop and can be seen for miles, an obvious strategic site. The first castle was built here in 1111, but this and several later versions were destroyed in various battles. The present variation, built in the 19th century, is supposed to be a reconstruction of the original but from the descriptions we had is grossly overdone, with “Gothic” chambers and “Renaissance” rooms. Disneyland, indeed. In any event, on our approach we saw from the number of cars and buses that its reputation for popularity was well justified, so we didn’t attempt to enter. 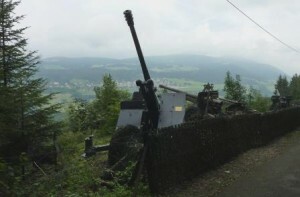 Continued then on a very pleasant drive through the Vosges, descending near the range’s north-east corner to the little village of Rothau and a delightful small aire associated with but separate from a quiet camp site. We shared the sport with only two or three others, only €6 including free electricity and free unlimited wi-fi at the van! So in the late afternoon and evening we did a lot of catching up with email, internet and stuff. The reason that we were in Rothau at all was that nearby is the site of the only concentration camp built by the Germans in what had been French territory. In 1940 Hitler annexed the long-contentious territory of Alsace, along with part of Lorraine. An SS geologist had been searching for potential quarries to supply building stones for the major construction projects planned by the Reich. He discovered a vein of attractive red granite at Le Struthov, previously a popular holiday and ski resort on the slopes of Mount Louise, in the Vosges. 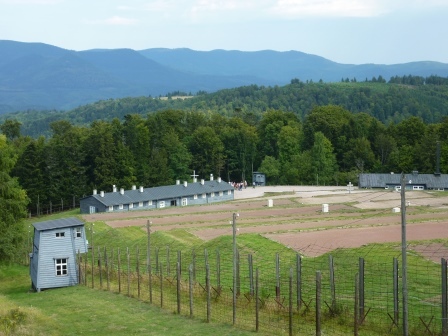 Himmler decided that a new work camp should be built there as KL-Natzweiler, and the first prisoners, mainly deportees, were transferred there in May 1942. As we have found to be the case so often, this camp is in a lovely location, steeply sloping and overlooking a wooded valley. 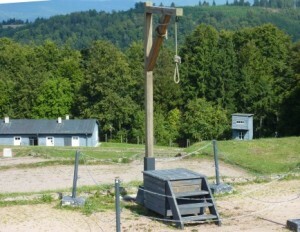 It is a steep 8-km drive on the winding road up from the train station at Rothau, where the prisoners would arrive. The walk that faced them was straight up the hill. Once there, it’s a tough walk up from the barrack blocks to the main camp gate, from where it’s another walk to the quarry. As at Mauthausen in Austria, the prisoners then had to get back to the camp carrying or wheeling loads of granite they had carved out of the cliff face. The winter conditions were murderous, literally, down to -200 C.
The camp’s history has two features of special importance. One is that later in the war it became the Germans’ favourite place to send captured members of the French Resistance, including those of other countries sent to assist them. Detested by Hitler, they were subjected to the treatment known as Nacht und Nebel, “Night and Fog”, or just NN. The idea was that once captured, they would disappear without trace or any record at all, contrary to the Nazis’ customary exemplary record-keeping. The undoubted bravery of the members of the Resistance and its glamorous image has long captured popular attention. Less well known is the exceptionally cruel response by the Germans to any deaths resulting from their activities, usually a random killing of a number of local non-combatants at some multiple of German deaths, but ranging to such atrocities as the complete obliteration of villages such as Oradour-sur-Glane, which we visited in 2011. In the camp museum there is only one paragraph on this aspect of the conflict, tucked away in a hard-to-read section of one of the explanatory panels. The success of the Resistance in hastening the end of the war remains a controversial and touchy subject. The other piece of work for which this camp became known was so-called medical experimentation, including typhus inoculation. One such experiment went wrong so badly that it led to an epidemic in the camp and the deaths of several prisoners. The other interest was in proving that the physiognomy of the body, especially the head, could differentiate between Untermensch and good Aryans. To this end, some prisoners in relatively good condition were gassed by phosgene in a small chamber just off the camp, pickled in alcohol, and dispatched to the new Reich teaching hospital in Strasbourg where their heads were separated. The camp is not easy to find, is not mentioned in any of the popular guides, and uses the word “deportee” to describe those who were interned and possibly die here rather than the more pejorative “prisoner”. Politically Alsace is still a very sensitive region, with most of the places and roads having German names but all the other signage being in French. 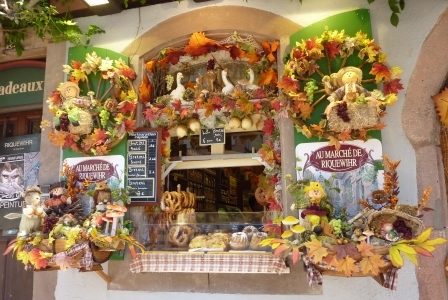 The local people tend to speak Alsatian, which is neither, and some refuse to speak French. We thought at the camp there is something of a “don’t mention the war” attitude. There were of course vast population movements in the early years of the war and afterwards, so a certain uncertainty of origin and ideology is understandable. Interestingly in this context, in 1976 the camp museum was deliberately burnt down, and there was more vandalism in 1979. We are not conscious of any such acts in camps we have visited in Germany, Austria and Poland. From Rothau we continued down out of the Vosges and down into the flat lands of Lorraine, and came to an aire at a marina on the Canal de la Marne au Rhin, which connects these two big rivers. We got a nice canal-side spot, and were able to sit out for a while on the wide grassy strip between us and the water. The marina manager was one who said he spoke several languages, but emphatically not French. All the marina signage is in German. Decided to take a lay day. We were the only van at the aire overnight, but during the day many more did come in, mostly German, as their holiday season comes to an end. There are doubtless also some who are heading south for the sun. Cloudy all day, not very pleasant. Long period of very heavy rain, winds and thunderstorms on the middle of the night. Then away for quite a long run by our standards, mostly on trunk roads but not motorways, red or green on the Michelin map. Practically no trucks because it’s Sunday. Started with a long gradual climb to the Lorraine plateau, which our Michelin guide unkindly describes as “a mixed-farming area of monotonous appearance”. This took us up to Metz, which we bypassed this time having visited only last year. As we noted then, the attractive city has a long and violent history. In 1870 the Prussian armies invaded Lorraine and Metz was surrendered as part of France’s humiliating defeat following the incompetence of its leadership. The city thus became part of the newly-declared German Empire and became heavily fortified as part of the German plan for a future war with France; a plan that nearly succeeded in 1914. In 1944 the Allied armies took ten weeks to eject the Germans from their stronghold. The route then quite closely followed the border with Belgium. As the kilometres rolled by, we began to get anxious about the fuel situation, about which I am normally very conservative. By the van’s fuel trip computer, although it could be close, we should have had enough to carry us the whole trip, of about 230 kilometres. Nevertheless, after mid-way I was resolved to fill up at any convenient opportunity. France, however, is one country that does not have countless fuel stations strung along its roads, and on Sunday afternoons, most are shut anyway. We finally did find one in a village that offered 24/24 credit card service; but as I expected, neither of my cards was accepted, same as in the railways. We did make it finally, with a computed 40 km to go, way below my comfort level! But we got to a splendid aire, one of the best, in Dun sur Meuse, a village on the river that is also part of the canal system. We parked in a line facing directly over the water near a berth for boats cruising the river, with both these berths and the parking managed by the local council through its tourist office. Not only was the price very reasonable (€7), we had free electricity and other services, and free wi-fi from a little utility building that enclosed a free washing machine and a sitting room. As everyone we spoke to was staying more than overnight, and all used the village shops in some way, the whole operation is an example of how these things can be made to work. We still had some afternoon left, and sat out in the sun until it became too cool. Blue sunny morning and a trip into the village for stores and a walk round this pretty little place. That said, Lorraine is something of a poor cousin to Alsace, and the undecorated buildings generally looked a bit run down. Topping a prominent hill behind the town is a chateau which, from a picture outside a local museum that was shut, looked like it might have been a prominent control centre for the several battles of the Meuse over the years. On a little bridge in the town is a railing with a plaque reading: “The Veterans of the Fifth Division of the American Expeditionary Force have erected this railing to commemorate the crossing of the Meuse River and the establishment of a bridgehead on the eastern bank by their division during the World War”. The 5th Division made the first crossing of the Meuse south of Dun on 5 November 1918, as part of General Pershing’s army. The USA had joined the war in its late stages, and with inexperienced troops suffered heavy losses after they joined the Allies: over 25,000 were killed in the campaign of the Argonne forest and the Meuse River alone. But they clearly played a brave and important part in what was an Allied breakthrough to the east that hastened the signing of the Armistice soon after. Afternoon started well, but clouds rolled in and by late afternoon it was raining heavily. Rain continued overnight and still showering in the morning, cool. We have been on Europe too long this year! But we are in a holding pattern now, and have time to spend another night in this excellent place. Walk into village for bread and oddities, and on our way back had a coffee with a pair of pleasant Poms living aboard a 42-ft steel cruiser on the canals, and appear well suited to it. Afternoon session in the internet, but otherwise still resting up waiting for my chest to clear. Miserable morning, late dawn after rainy night. Cleaned up and watered, and said farewell to the Poms, then first stop the nearby petrol station! A simple little place, so just bought half a tank of diesel with cash to avoid any potential credit card difficulties. First part of run continuing north was quite interesting and scenic. We were almost immediately in the Walloon region of Belgium, because our route choice to avoid tolls inevitably took us on to the toll-free Belgian motorways. But first we spent quite a time in the Belgian part of the Ardennes, where the hills and heavily wooded landscape did not, as expected, provide a barrier to the German advance on France in 1940. It wasn’t long before we were on the freeways and the driving much faster but more demanding. This is a very busy truck route for a start; then after lunch we were again, on a motorway, assailed by torrential rain and horrendous visibility. Basically the route turned left after Namur and re-entered France, and so on to the industrial city of Lens. 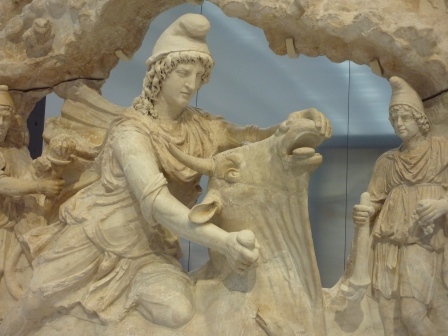 The purpose was to visit the Musée du Louvre-Lens, which opened less than a year ago, in December 2012. It is an extension of the Louvre in Paris, and serves as a way to widen its audience and allow the showing of artworks from the Louvre’s vast collection that would not otherwise be on display. It is centred on a huge open gallery, wide and 120 metres long, and presents the exhibits as part of a walk through time from ancient to modern. It is done extremely well, promoting an understanding of the evolution of art in stone, sculpture and painting over the ages. The lighting is exceptional, and non-flash photography is permitted. Terrific. That display is on until 2017, but there are other temporary exhibitions. 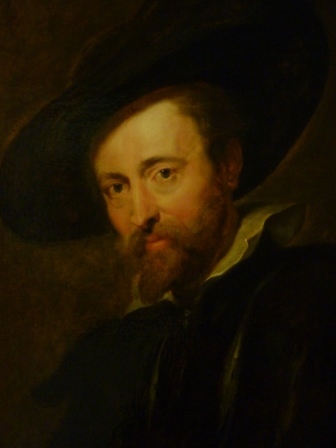 The primary one now is of the work and times of Pierre Paul Rubens. It is again a marvellous show of a selection of his works and some of his contemporaries, and puts the work into the context of his faith and commitment to the Counter-Reformation. 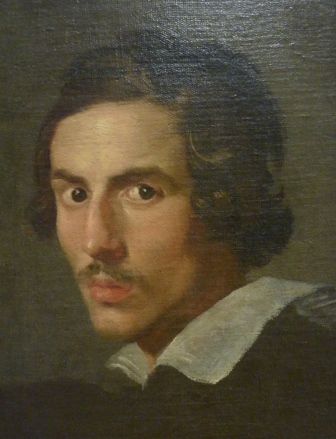 A contemporary who shared similar view was the Italian architect Bernini, and there is a fascinating pair of self-portraits that contrast the self-confidence of the established entrepreneur and the artistic anguish of the young Italian. We had known that there was provision for overnight motorhome parking in the car park of the new museum. What we didn’t know that it was very hard to find, with only one little sign in the vast acreage of car parks that the museum shares with a huge sports stadium. We finally parked in one of the approved spaces (right next to McDonalds! ), and were then faced by a walk of 1.25 km to the museum which was out of sight and with no indication which way to walk. Anyway, my ill temper settled once we were in among the artistic treasures. The rain had stopped by the time we arrived, but there was still a cool wind. The sun broke through the clouds for a few minutes just before 6:00 pm. Quiet overnight, and amazingly, mostly blue skies by 8:30 am. Left this enormous car parking area with some difficulty (faced by a barrier at one time), and started off up the D943 “red road” to Calais. A busy road, but we needed cash from an ATM, fuel, and a Lidl booze stock-up, and this was a better route to do all this than faster or quieter ones. In sunshine mostly, did the business and got to Calais for lunch, parking in the usual car park. Had a quick and surprising chat with an Australian couple in a caravan, touring Europe for six months and just off to France and Spain – and live in Bayview near the Winerreremy dog park! 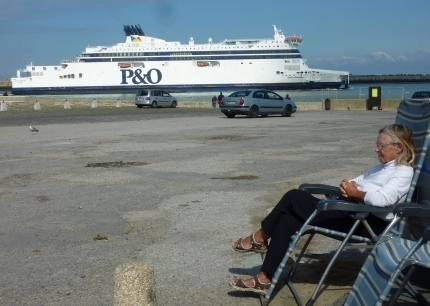 Into town to P & O Ferries, having waited until the end of their 1200-1400 French closing time! Booked for 9:50 tomorrow, having asked for the cheapest crossing and got a choice of two times at €55, acceptable these days and convenient. Moved round to the aire on the dique to the east of the harbour for the first time, got a good slot in the front line, and had a stroll along to the end of the pier. Sunny all afternoon, and like many others in the line-up, sat out for a while. The cost is €7, collected at about 5:00 pm by a friendly council worker, and we were pleased to see that he moved on a caravan parked by a rather bolshie-looking Pom. Pleasant and interesting lookout over the sea and, the harbour entrance. Incredible number of shipping movements, including three ferry lines and miscellaneous dredgers, small freighters and even sailing boats. Misty damp morning, but plenty of time for breakfast and to get to the dock. Ship a bit late in, and unloading and loading slow – captain blamed some technical issues and the resurfacing of the port vehicle areas – so about 35 minutes late leaving. Easy crossing in moderate visibility, sat up front reading. Unusual but welcome absence of children! And so back over La Manche and back to England to revisit relations and friends and get the van back into store at Milton Farm in Dorset, before flying back to Australia a week later. Maybe next year will be the last that we spend all summer in Europe – we have visited 28 countries in the van in our seven years motorhoming there, with little retracing of our steps – but what will we do after that to escape the Sydney winter? Only time will tell, a dreadful cliche but true for all that. Stay tuned.